Not only do the kids go back to school, it’s the perfect time of year to propagate your favorite roses from cuttings! 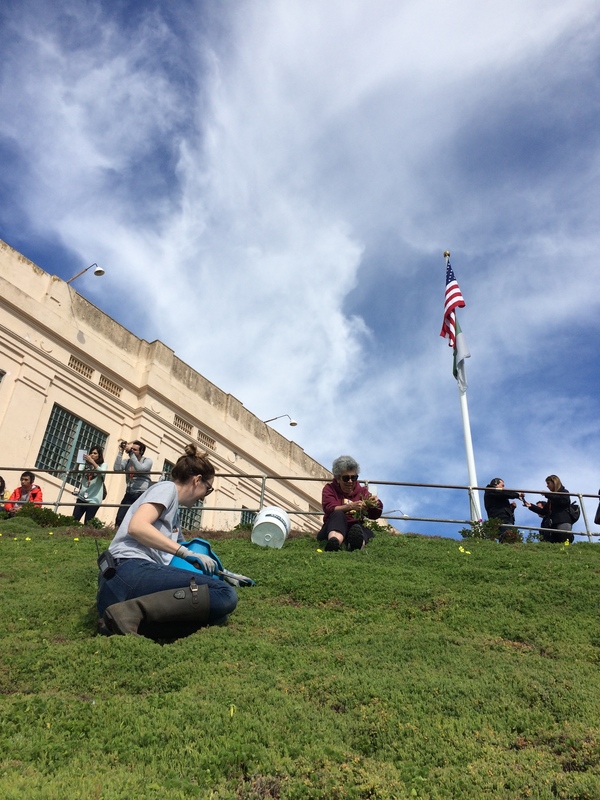 Tapping into the wealth of knowledge from other volunteers on Alcatraz, we found out that a bird docent has a skilled hand at propagating heirloom roses by cuttings. Karen Vandergrift willingly offered to demonstrate her knack. To start, after the rose has bloomed and before the rose hip has started to form, a cutting should be taken down to the fourth leaflet, and cut the stem ½” above the bud. 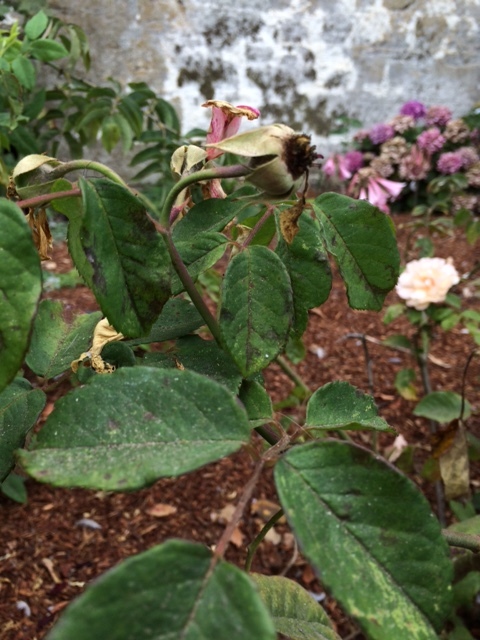 Next, pull off the leaves from the lower two buds and trim off any buds or blooms still remaining on the cutting. Then, with sharp pruners, cut the top half of the leaves off. This will reduce the surface area that will draw moisture out of the plant. After that is done, lightly scrape off the layer of stem down to expose the cambium that is on bottom 2” of the stem. Dip the cutting in root hormone. Using a clean one-gallon pot, stick the cuttings in moist soil, we used our Alcatraz compost, but a potting soil mix would be fine. We put three cuttings in one pot, so hopefully one of them would take. 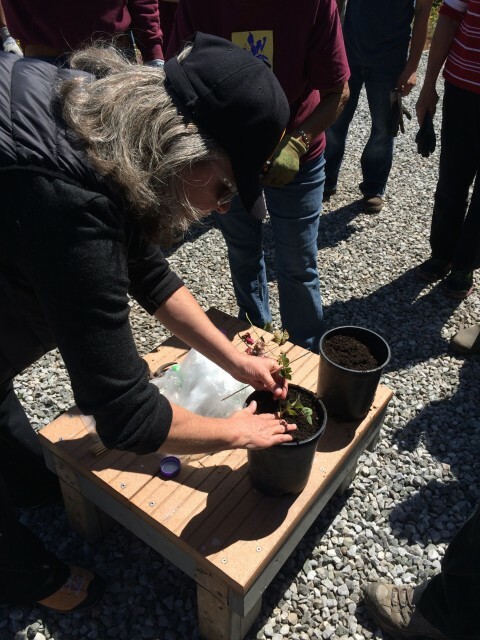 Karen explained that she likes using a 1-gallon pot so the cutting has ample room to grow and does not need to be disturbed by repotting if it were to be started in a sleeve. 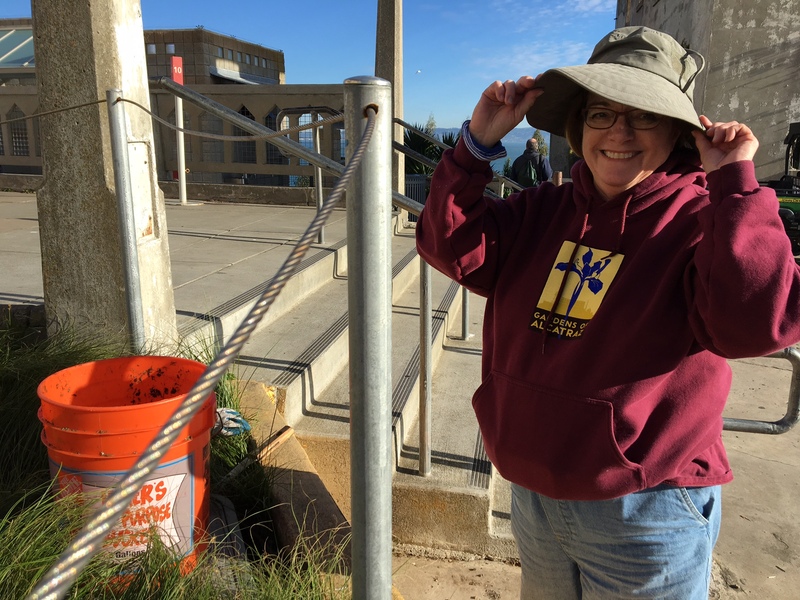 She also explained that the 1-gallon pot will not dry out as fast as smaller pots. 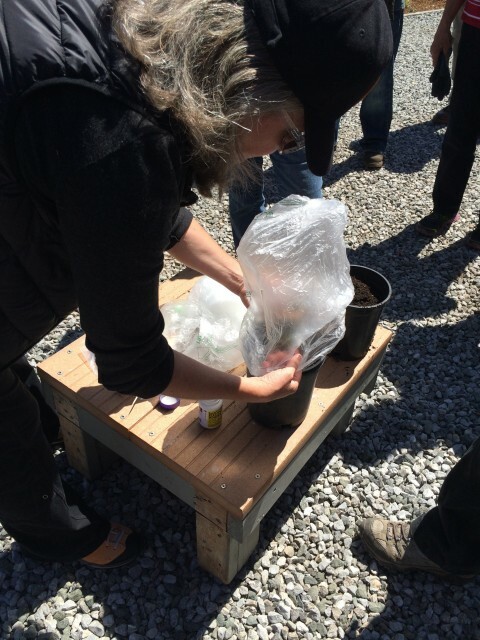 Create a mini-greenhouse by placing skewers in the 1-gallon pot and putting a plastic bag over the skewers. The plastic bag and cutting the leaves stops evapo-transpiration that dries out the soil and the tissue of the cutting. Be sure that the leaves of the cuttings are not touching the sides of the bag as this would cause the leaves to rot. The pots are in our greenhouse, out of direct light. We should have rooted cuttings in 6 weeks. We were instructed to water a little bit in one week – and mostly lift up the pots to see if they are light, then they need water. If no growth is obvious in 3 months, then we’ll try again! Help save the soil you wonder? Are we not in drought? Should we not be saving water instead? I wondered these same questions until I listened to Dr. Stephen Andrews, a soil scientist and professor at U.C. Berkeley. Stating the fact that California is now the driest since 1580 was enough to scare everyone in the room. California depends on water from snowmelt in the Sierra Nevada that slowly melts over the summer months. The snowpack gets replenished during the winter. Without a reliable winter to bring moisture, there is more at stake than just a lack of water. 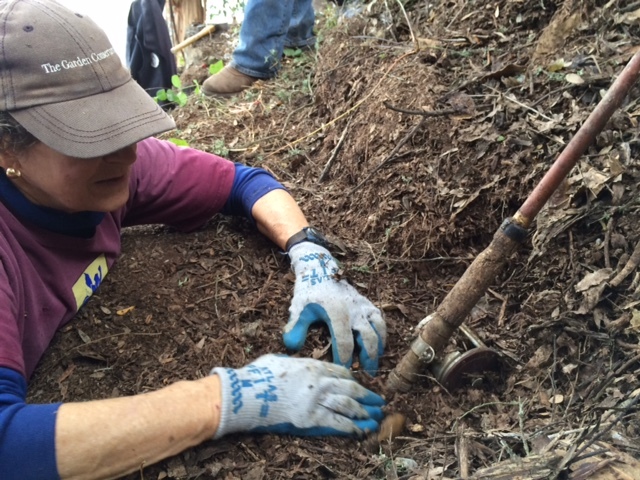 Another fact – Just 1 teaspoon of forest soil can contain 10 billion bacteria! Wow! And of the 10 billion, we hardly know anything about them. 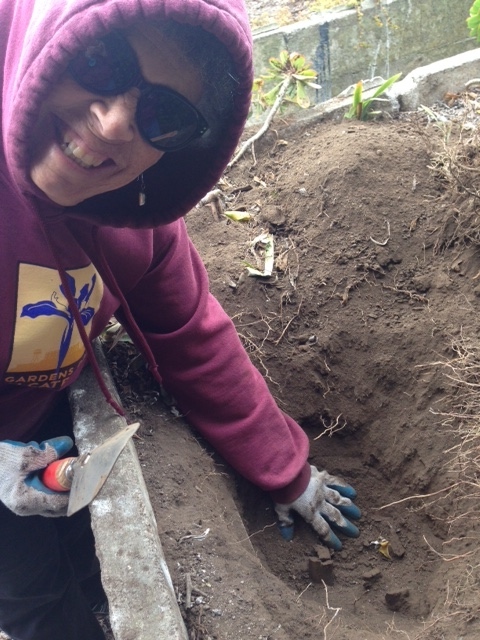 Another fact – California has 15.5% of rare soil types and 104 of endangered soils in the USA. The loss of a soil series is a bigger problem than losing an endangered animal. 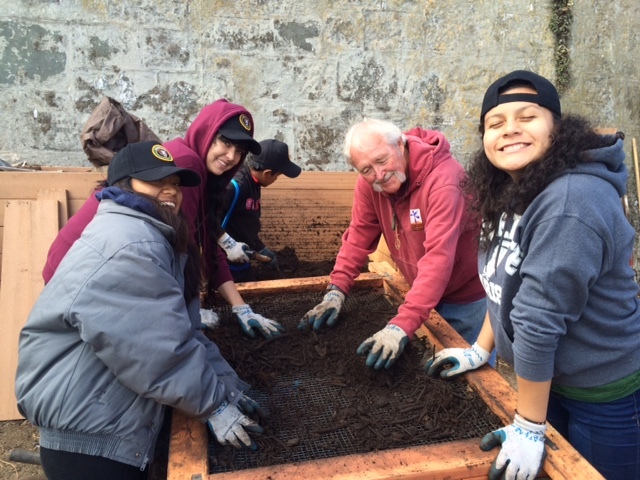 As Dr. Andrews explained – when you lose a soil, you lose the entire community of organisms supported by it. There is so much we do not know about the ground beneath our feet, that we are not even aware of what we are losing. To further open our minds, Dr. Andrews pointed out the Clean Air Act protects the air, the Clean Water Act protects the water, but there is no Clean Soil Act – very astonishing considering the soil is what we depend on for our food. So what can the average person do? Ask yourself ‘What is your lawn doing for you?’ There are plenty of low-water lawns to choose from now, check out ‘No Mow Fescue’ or a Delta bluegrass blend. Two-thirds of a plant’s biomass is underground so getting water to the roots is vital. A deep watering accommodates plants as they grow over time. Water emitters need to be moved as the plant grows to encourage proper root development. If you have a tiny emitter right at the base of tree and never move it, the roots will have no reason to grow further and anchor the tree. New systems have many programs that you can set, including ‘wet weather sensors’. Be sure to group plants with similar water needs. Keep every drop in your yard, make it your goal to not send any runoff to the street. Capture, re-use and filter your water. Create a water garden, install a water catchment or consider using your grey water to water landscape plants. Be sure to use bio-degradable soap and alternate the landscape plants you are watering. On average 14 000 gallons of water falls onto a rooftop during the rainy season – this stored water could be a source of water during a fire or for an earthquake. The water tanks alongside a house can help moderate the temperature of the home as well – keeping it cooler in the summer and warmer during the winter. 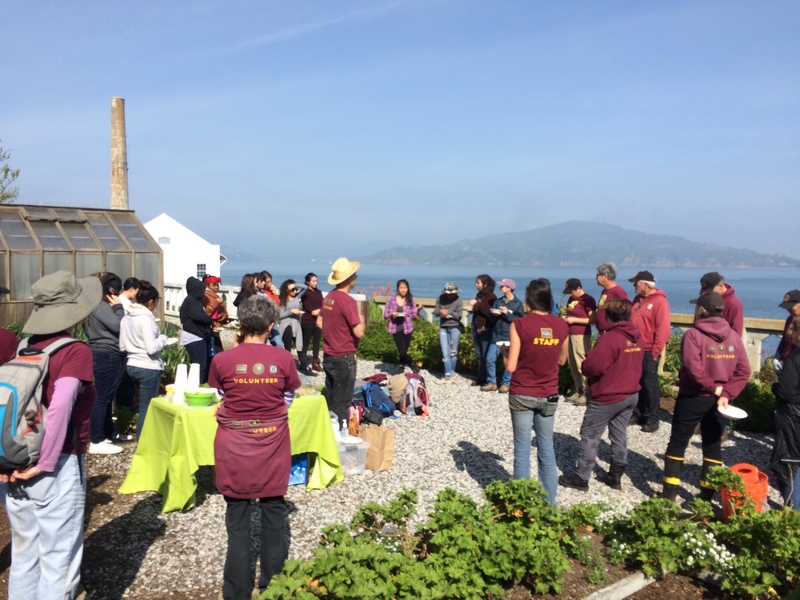 The Bay Friendly Coalition provides a list of recommended plants for the Bay Area. Most nurseries will be able to help you choose wisely. Another tip – purchase smaller sized container plants – 1 gallon instead of 5 gallons, 4″ pot instead of 1 gallon. 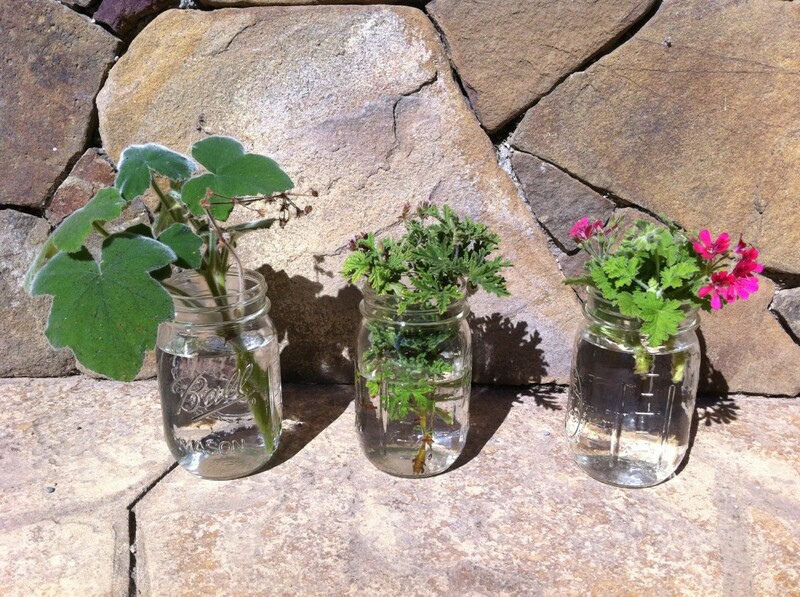 The smaller sized plants will require less water to get established and be under less stress. 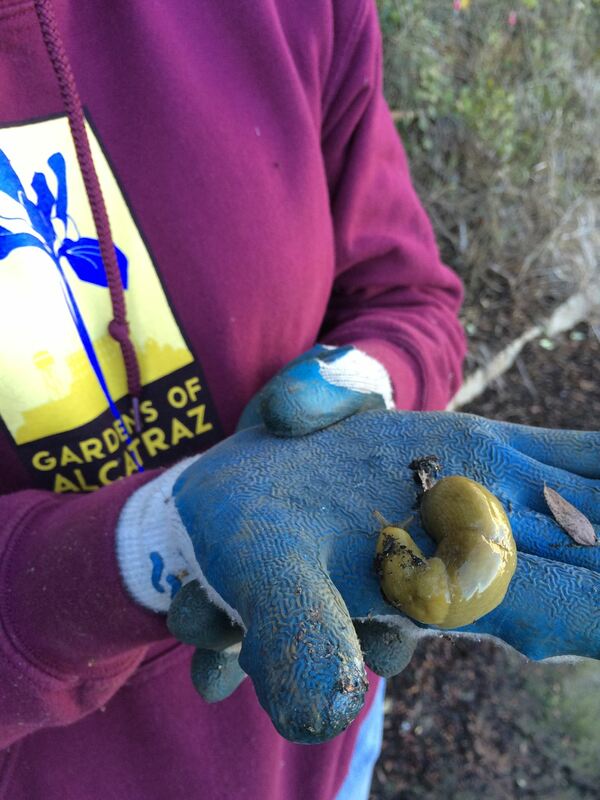 Fertilizing encourages plants to grow – but this new growth needs water. 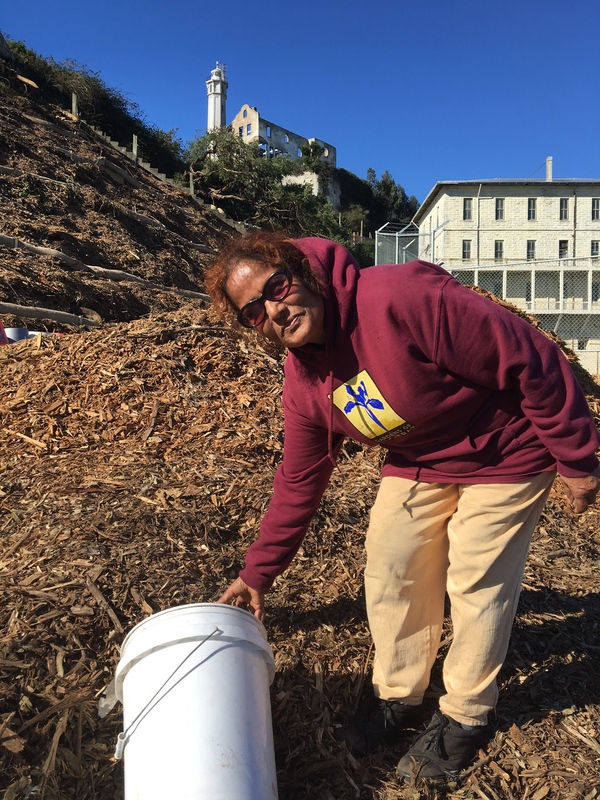 Feed your plants with compost. 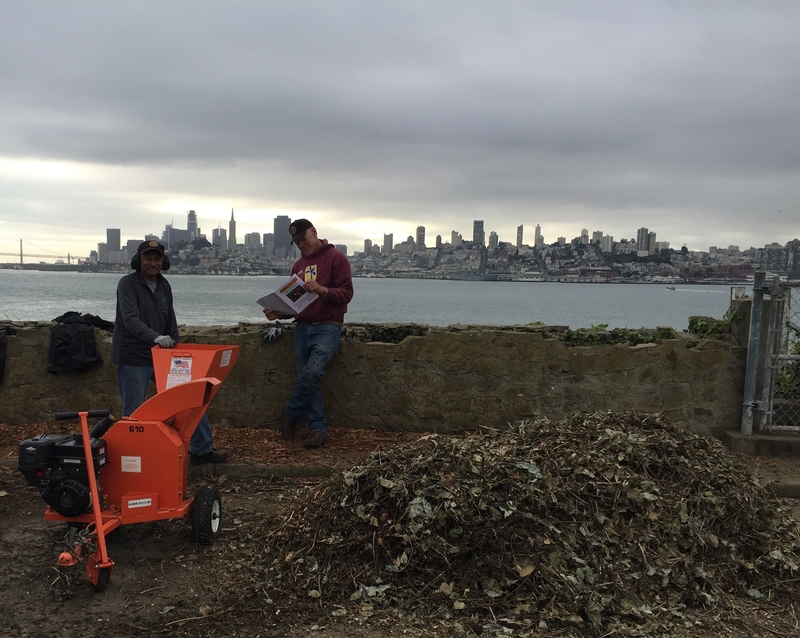 The nutrients will become available as the compost breaks down naturally. Use compost instead of fertilizer. Fertilizer contains salt, which is harmful to soil bacteria and burns plant’s roots. When the soil bacteria is stressed, disease has a chance to settle in. 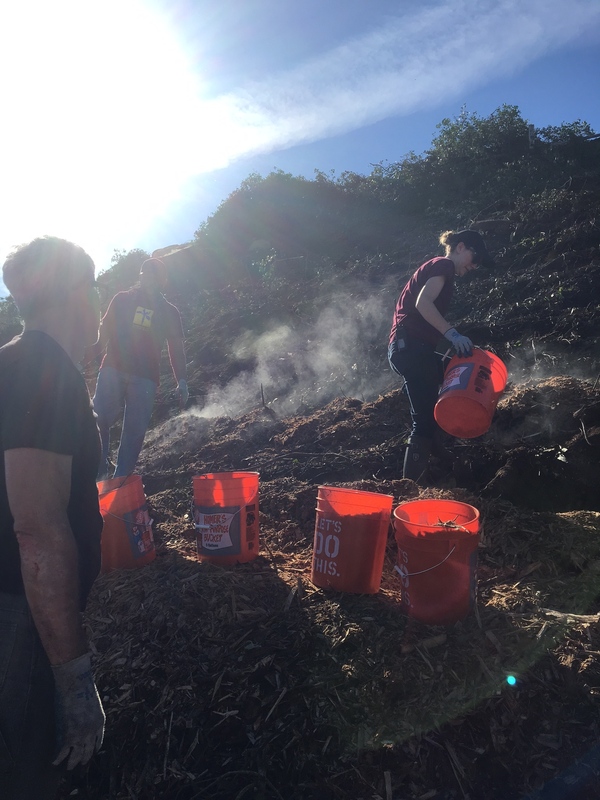 Compost is natural and will decompose over time. 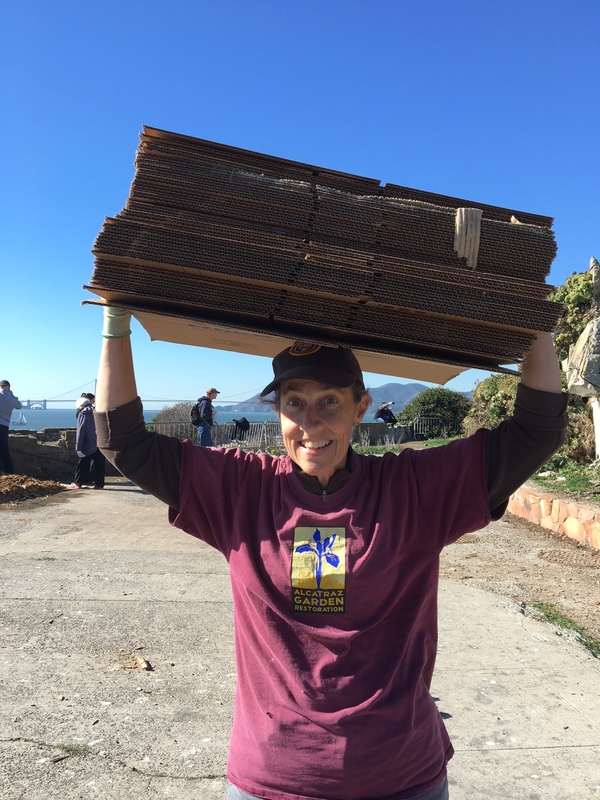 Mulch is a permanent cover over the soil and can be done in layers to conserve moisture in the soil. 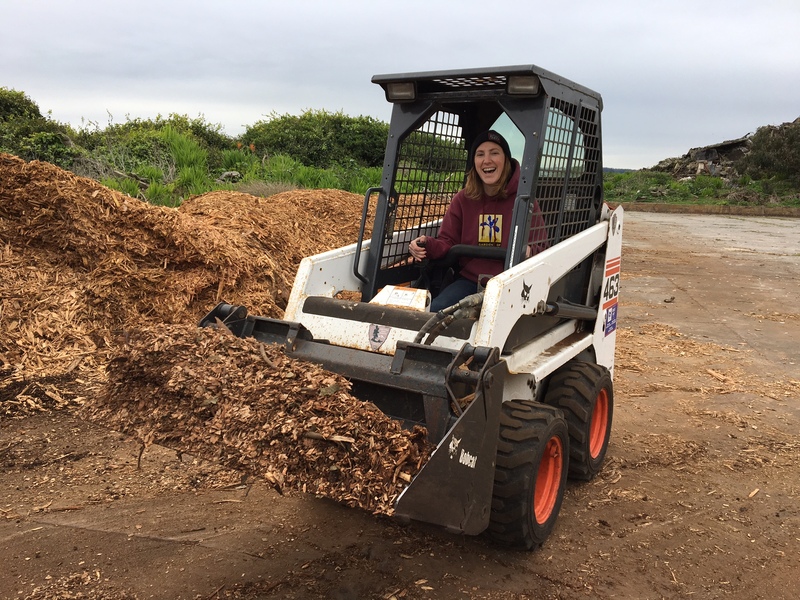 The mulch controls weeds and moderates the soil temperatures so the plants’ roots and the soil bacteria have a happier home. 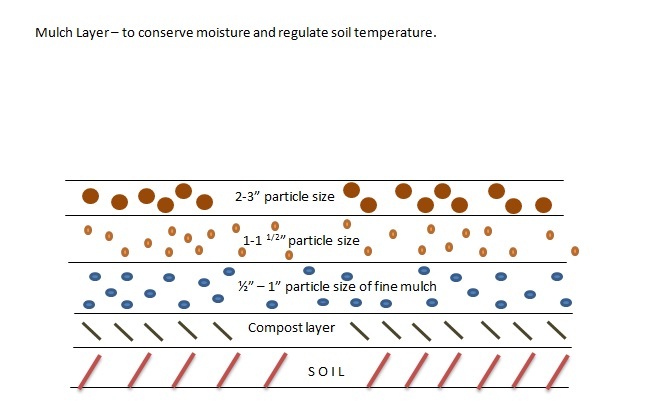 Below is a diagram of what a mulch layer looks like. The larger particles in the top layers will decompose as a new layer is added each year, thereby becoming the layering underneath. 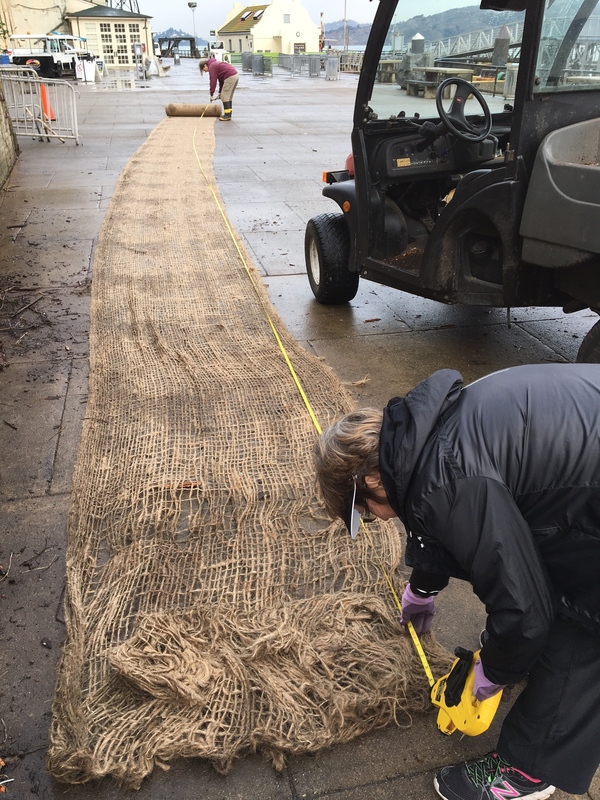 Mulch layer to conserve soil moisture and to moderate soil temperatures. 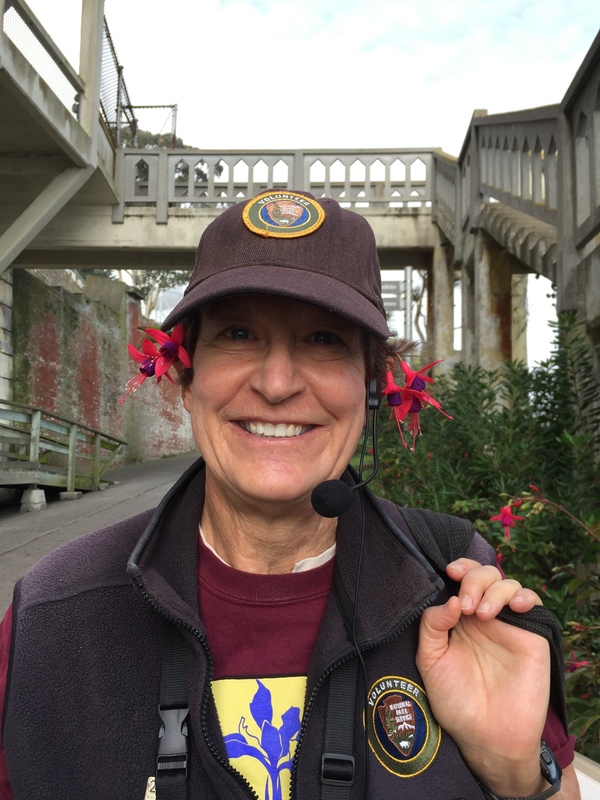 Did you know the Dahlia is the official flower of San Francisco? On October 4, 1926, the San Francisco Board of Supervisors took a vote and animously decided that the Dahlia best represented their city. 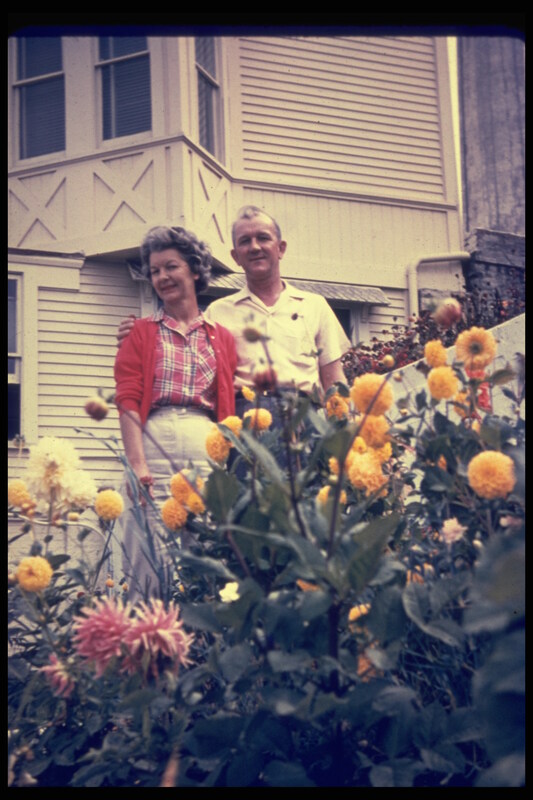 The reasons the Dahlia was chosen in 1926 still hold true today – San Francisco is still a world-class city – still innovating, has spirit and still has foggy, cool summers. Since the 1920’s, dahlias have had a dedicated plot near the Conservatory of Flowers and are an attraction for locals and visitors throughout the summer. 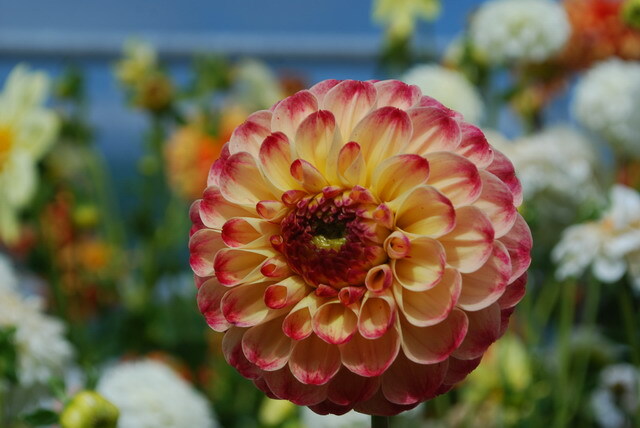 With dahlias being so popular, perhaps this is why the residents of Alcatraz began to grow them. Our small collection consists of heirlooms from the 1880’s through the 1940s. 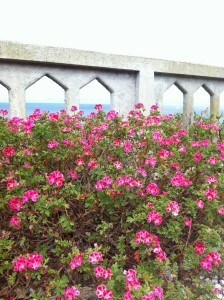 The flowers are just beginning to bloom – time to take in this history within history on a tiny island. 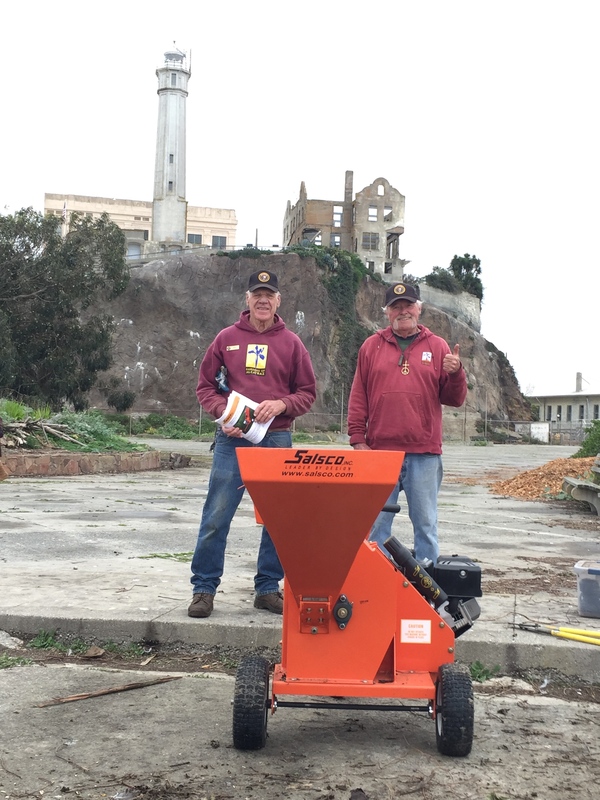 California has traditionally gone through cycles of drought and it was an important factor when the Alcatraz Historic Gardens project began in 2003. 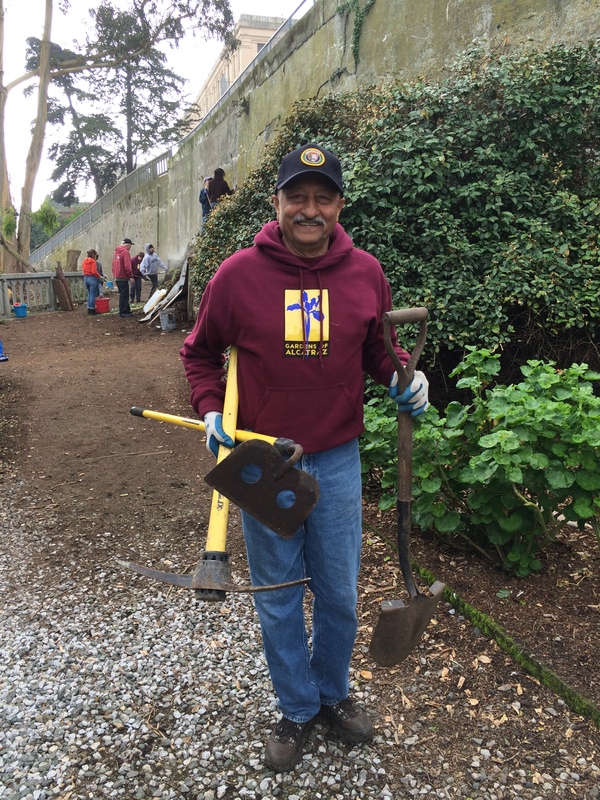 Restoring an island full of plants did not make much sense if there was no fresh water to care for the rehabilitated gardens. From the early days of the preservation, there were many common sense things that were done. 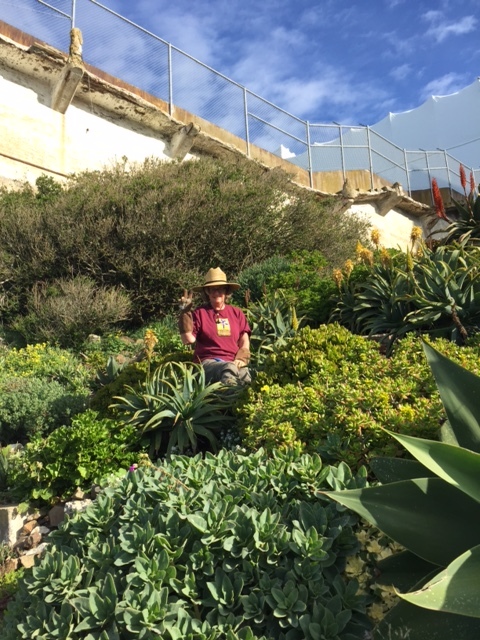 The simple actions of designing drought tolerant gardens and timing the planting for the winter rains were easy enough to work with. There is such a wide variety of plants that can tolerate and even thrive with little water, that this was never a hindrance to the revival of the gardens. In fact, with now over ten years of first-hand experience on the island, we have built up a list of ‘Alcatraz tested’ plants that we provide on our website. 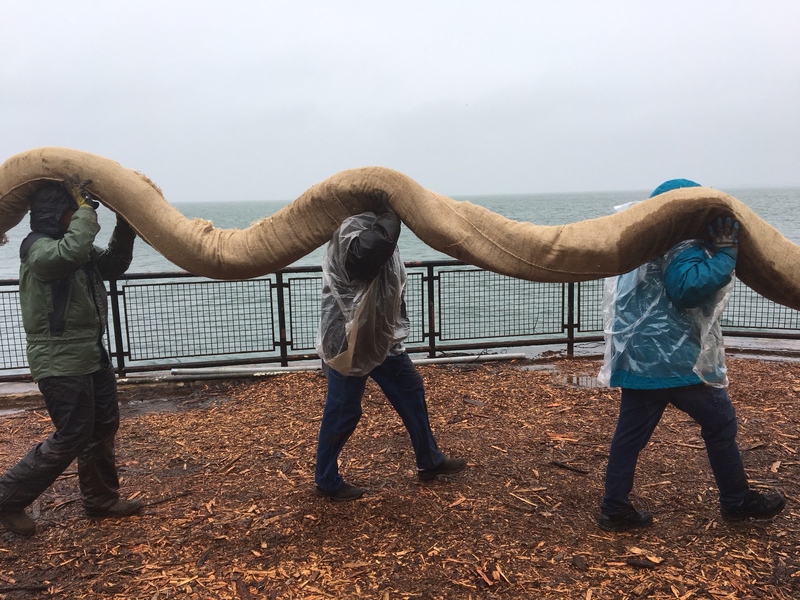 With rain collection being a known historic occurrence on the island, obtaining approval to once again collect rain water was straightforward enough – again, this had been always been in the garden work plan. However, despite filling the 12 000 gallon catchment to capacity each year, the shortage of rainfall is not saturating the soil. This means that the gardens begin the dry season already thirsty. For the past three years, we have begun to use our stored water in the early spring, instead of months later in the summer. 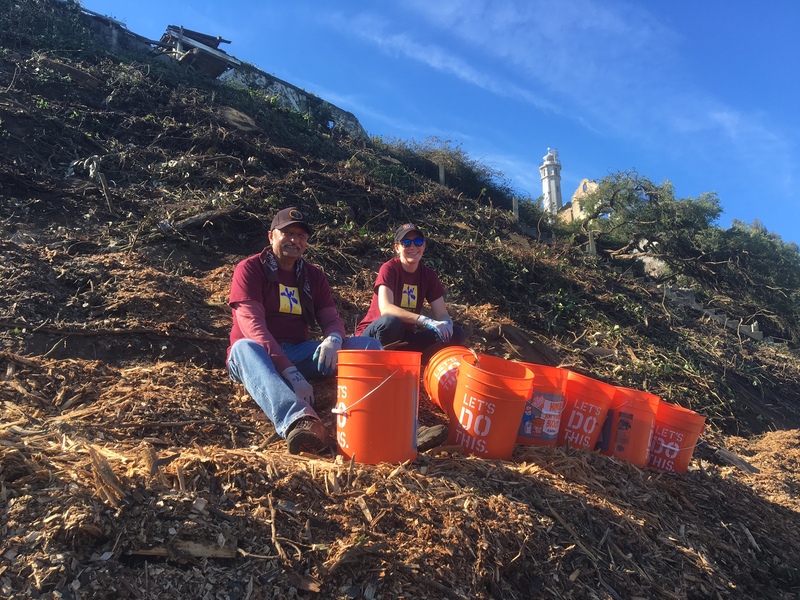 We have officially entered our fourth year of drought and we wanted to be pro-active and conserve where we can. 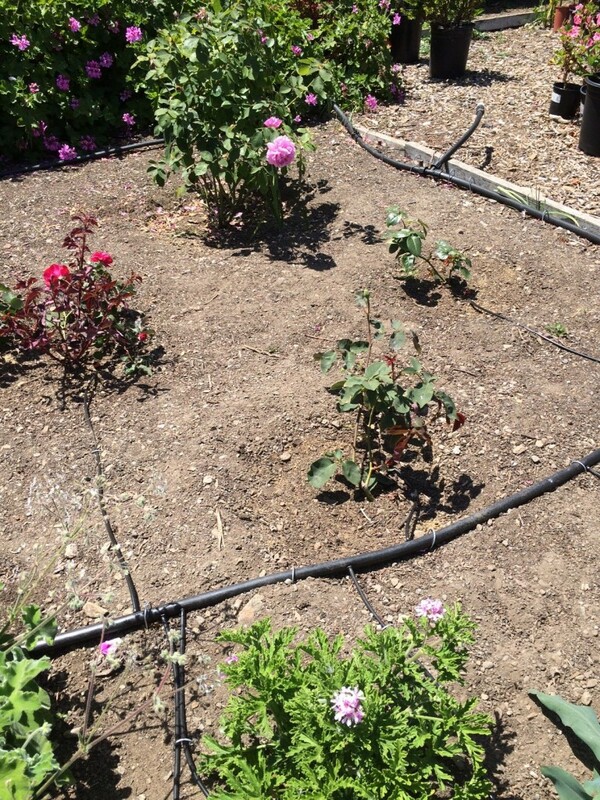 This year we installed drip irrigation to save water by watering directly to the plants, avoiding overhead hand watering. So far, the rose terrace, Officers’ Row, and two sections of the Prisoner Gardens are on a drip line. We also installed a drip line to establish the native sedge lawn in front of the cellhouse. Once the historic lawn is established, two inches of water are required each summer month – a huge saving from the needed one inch per week for the typical turf grass. The irrigation in each garden area is divided into zones, so we can water sunny areas more, and the shaded corners less often. 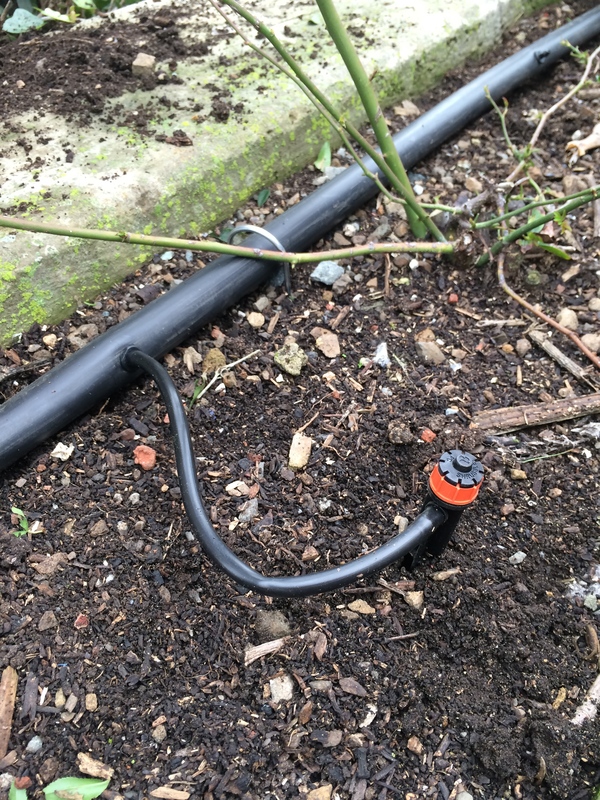 We have also attached inexpensive water meters to each of the hose pipes to keep track of how many gallons are being used on each garden area. 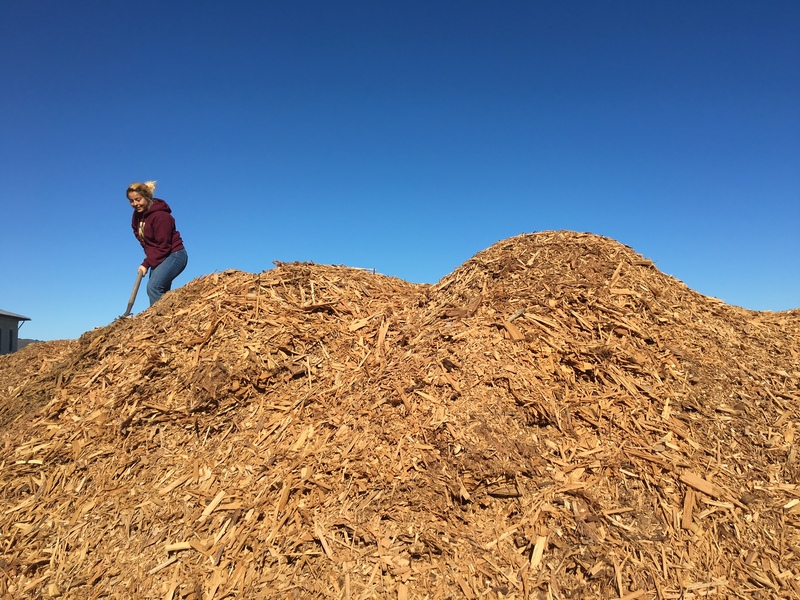 This year we also are using fine wood mulch to conserve soil moisture. 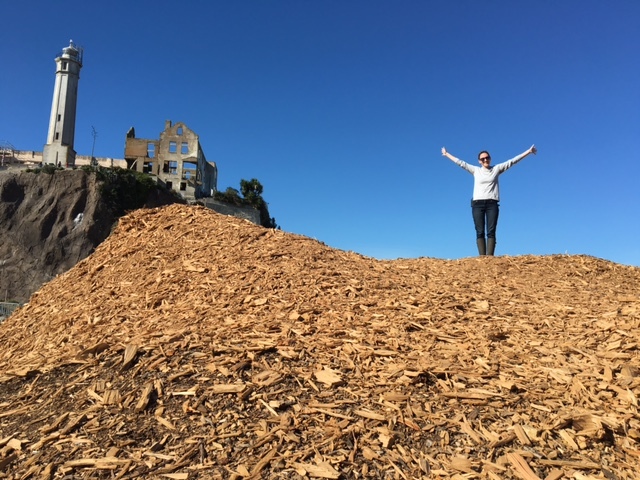 Mulch was not used historically, but cultivated soil was the historic look. 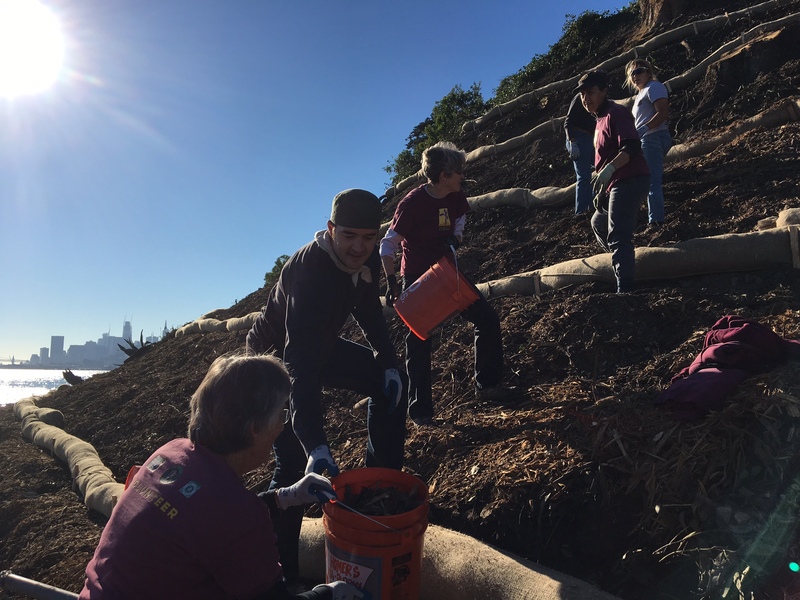 Now, we opt for a more permaculture ‘no-till’ approach with fine ¼” mulch on top. 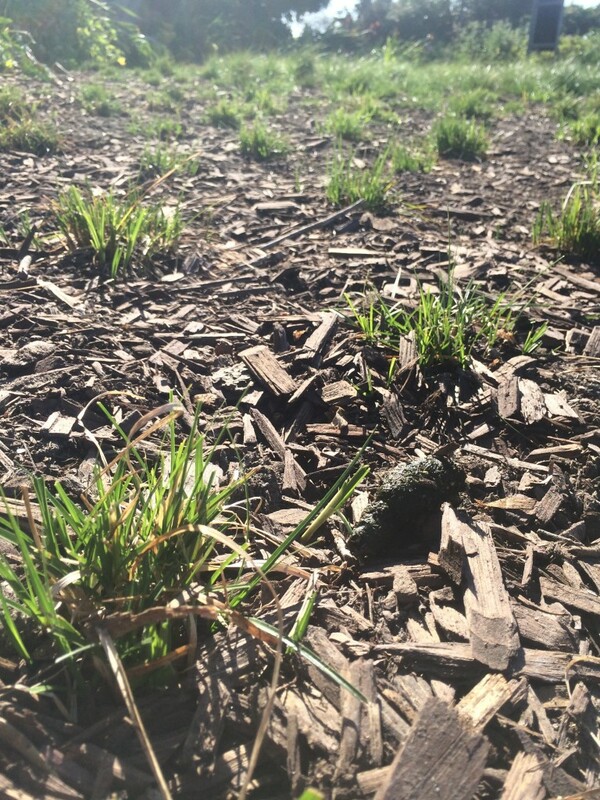 The no-till improves the health of the soil, and the mulch will conserve moisture in the soil. 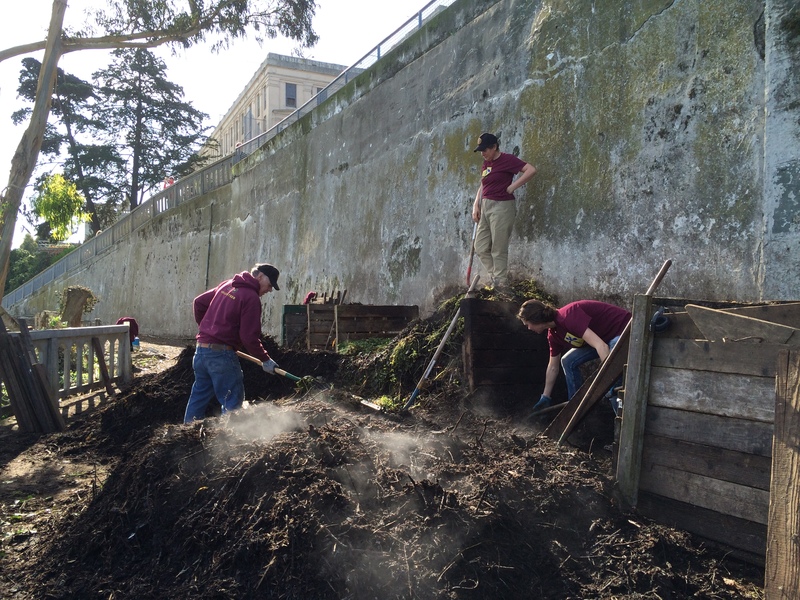 The wood chips will eventually decompose, adding to the organic matter in the soil. Another water saving tip is to use perennials and not annuals. The majority of the garden plants are perennials. Perennials are better suited with typically deeper roots that can withstand dry conditions. Aside from the recent lawn planting, our last major planting was back in 2010. 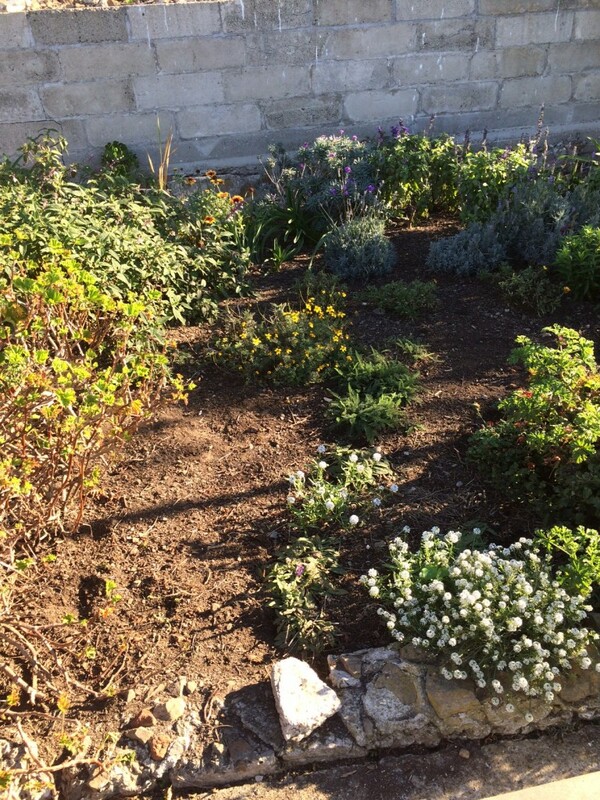 The perennials are now established and can tolerate drier soil. 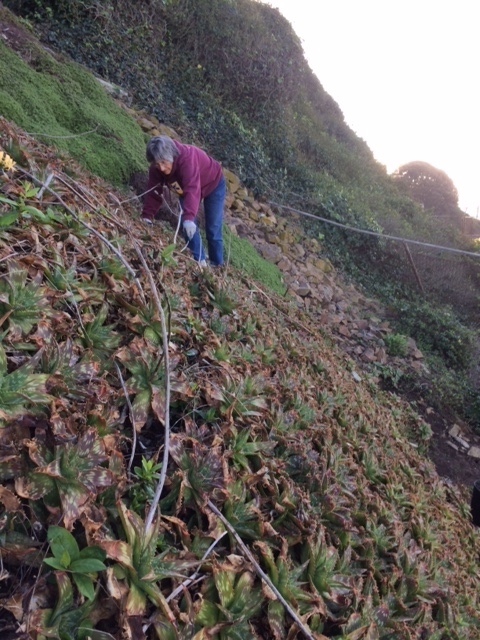 If you ever try to pull out a native California plant versus a non-native weed, the native will put up a fight while the non-native will easily pull right out. As the summer continues, we may opt to not plant some of the beds which typically would be planted with annuals. 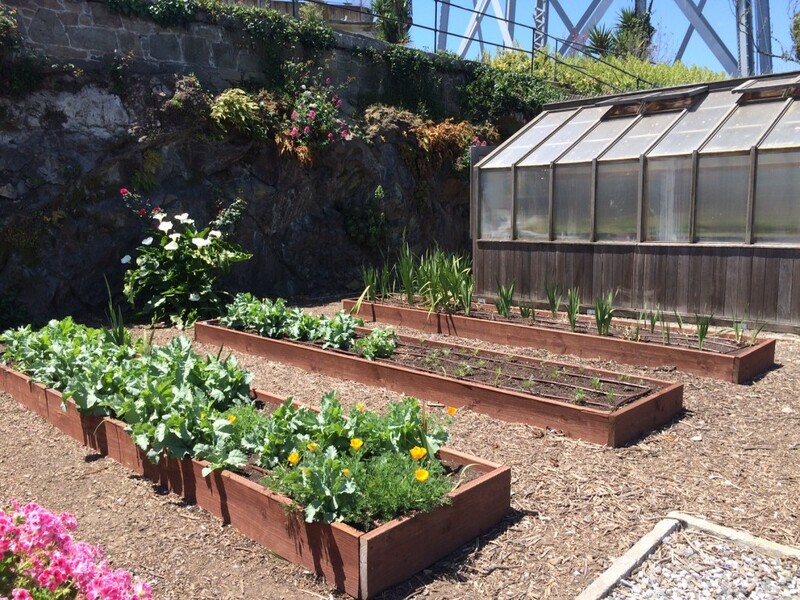 For example, the raised beds in front of the greenhouse have been planted with spring and summer bulbs like cape tulip, Dutch iris and gladiolus followed by summer annuals. This year, we will likely omit planting the annuals and leave the raised beds fallow instead. As our drought continues, I am seeing more lawns being ripped out and replaced with drought tolerant options, even artificial turf. A trip to see our gardens is well worth it to get ideas for your own backyard. 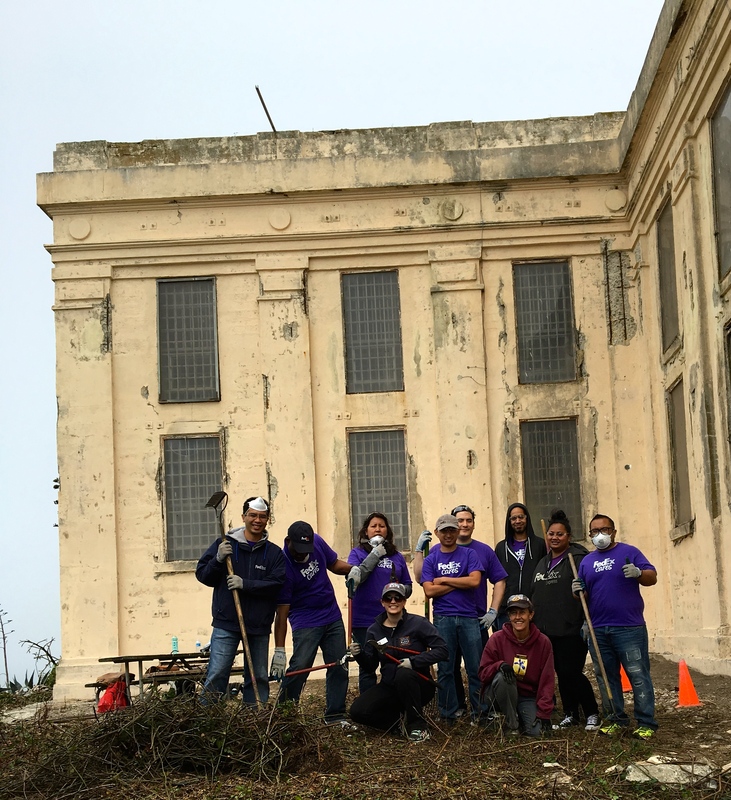 Seabird nesting season is in full force on Alcatraz. 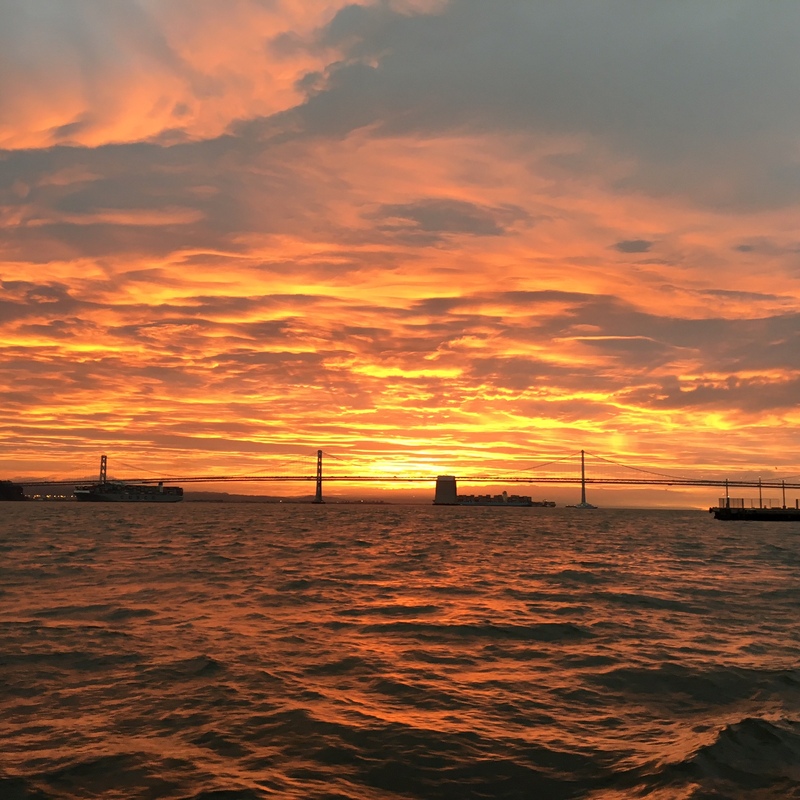 This wonderful time of the year is a rare chance to see many of the Bay Area’s seabirds nesting and raising their young. In numbers (and in volume) are the Western gulls. 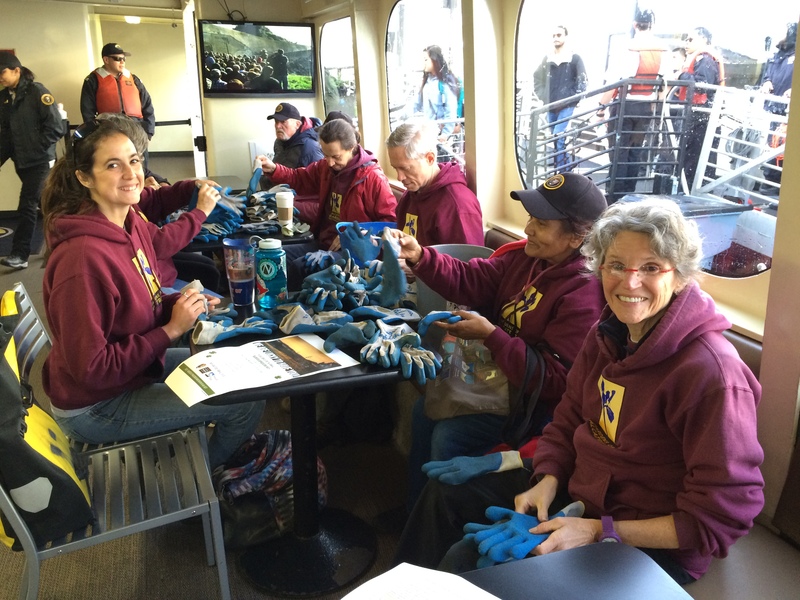 Last year they counted in at around 2000 pairs. However, their arrival always comes with a bit of apprehension. 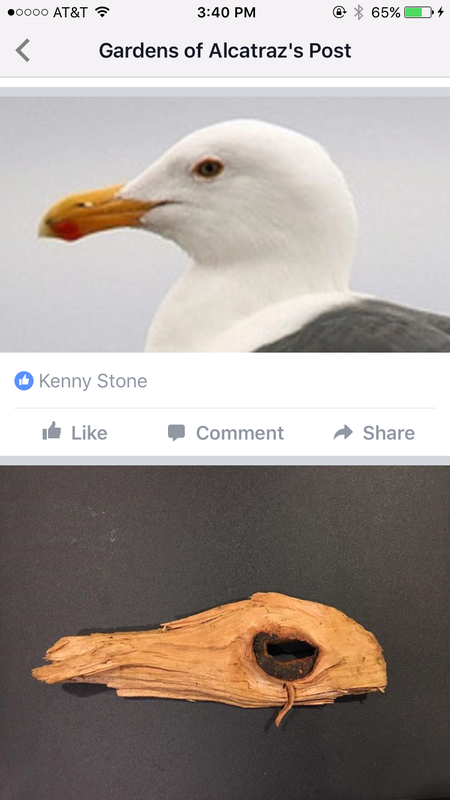 The gulls of course need material to make nests and must also claim territory. 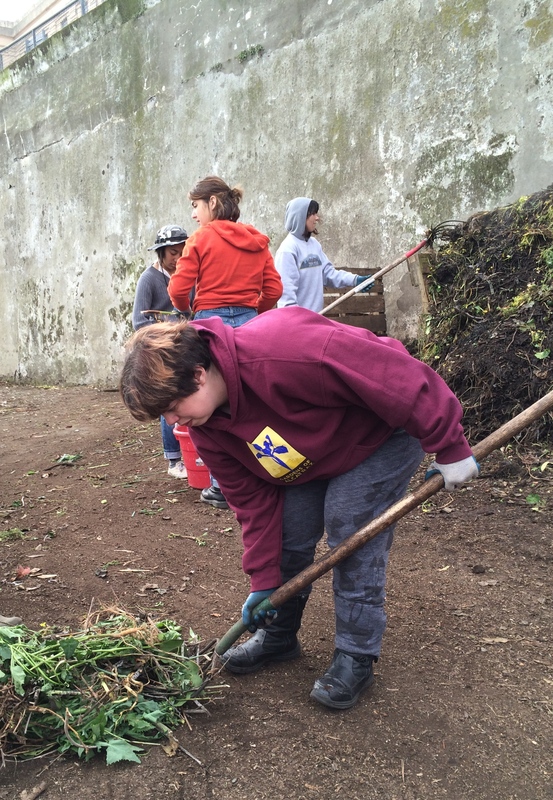 Both of these tasks mean that plants are torn up and shredded, and all too often these are garden plants! 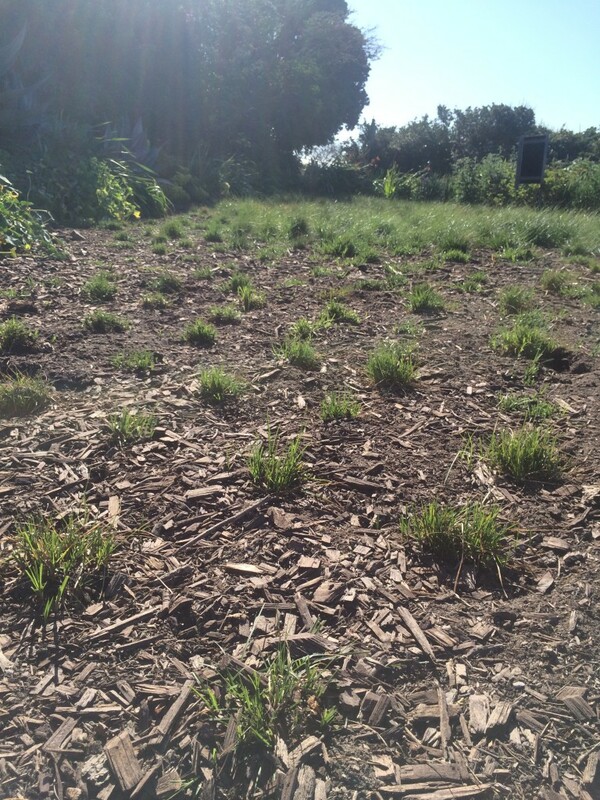 We have come to expect a bit of damage but with the native grass, Carex praegracilis, lawn that was planted with plugs we were a bit nervous if the plugs would take root and be strong enough to withstanding the tugging by gulls. The plugs were planted at the beginning of November when the rains would hopefully start. While we had some showers we had to supplement with hand watering too from our rainwater catchment. About 1/3 of the lawn was planted and now 5 months along, the plugs have started to send out stolons and are spreading. On a recent sunny morning, while checking the gardens over, I noticed a puzzling crime scene – the grasses were being shorn off close to their bases. Guilty by past behavior, I immediately suspected the gulls. But, the telltale sign of shredded vegetation was not present. In fact, the missing tops of the grasses were actually gone! What could this be? We don’t have deer or rabbits and yet the grass looked ‘nibbled’. Examining the scene closer, I spied the ‘evidence’ left behind – droppings. Sure enough Canada geese had found our lawn. There are maybe 3 pairs of geese on the island and they were making our lawn their morning buffet. For all of our planning and thinking of possible ‘what could go wrong scenarios’, we had overlooked the population of geese and their liking of grass. Luckily, few plugs have been pulled out, the geese are proving to be more grazers, and hopefully the plugs will continue to grow. Mowing actually helps grasses get thicker and encourages them to send out more stolons. The lawn is slowly being ‘mown’ from left to right, but at least the plugs are being fertilized too. With the mandated 25% cut in water usage in California, I’m so relieved we choose to have a native sedge replicate the look of a lawn. Our ‘lawn’ will be low maintenance and will only require 2” of water per month to stay relatively green throughout the summer months. 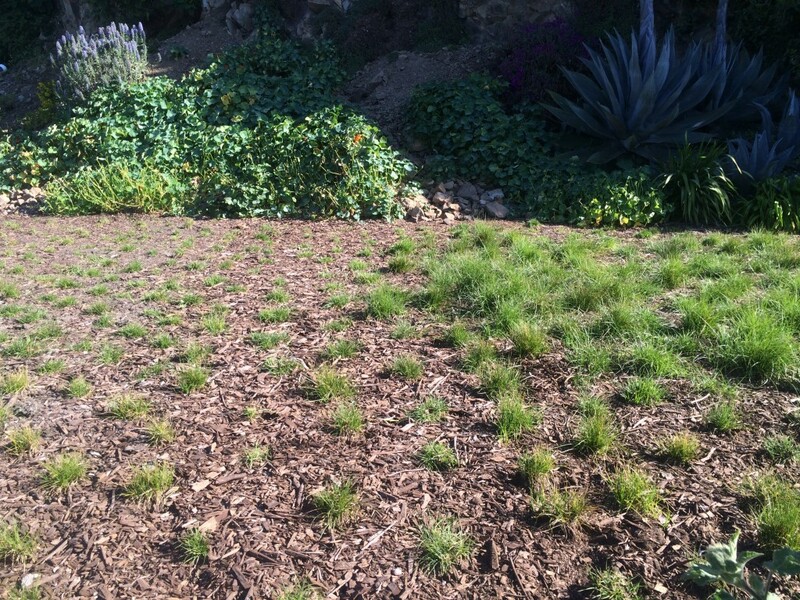 As Alcatraz is a destination, I’m hoping that visitors will take notice of our drought tolerant lawn and ask questions. The lawn will also be a topic on our garden tours and offered as an alternative. 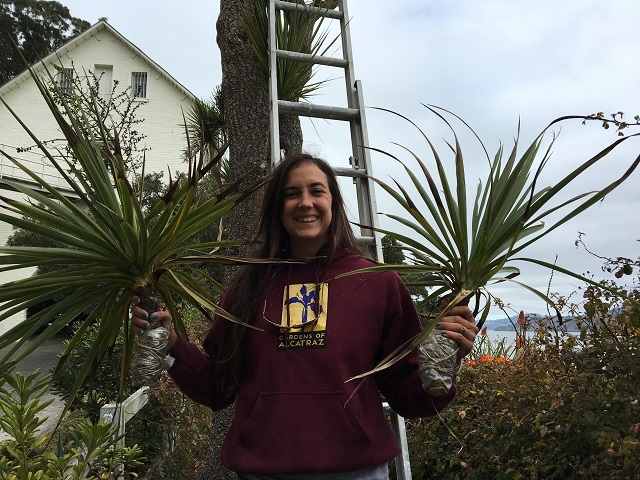 Technically this past Monday was a workday but instead of being on our beloved island, we had planned to go to the Dr. Herman Schwartz garden – Bolinas Botanical Garden – to take cuttings of succulents to add to our own Alcatraz garden. The trip hardly seemed like ‘work’. 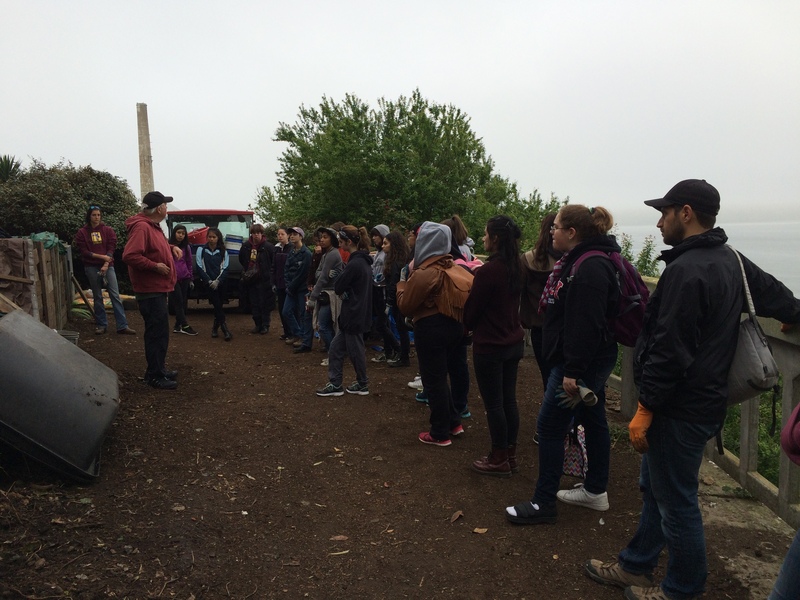 Marin-Bolinas Botanical Garden started by Dr. Herman Schwartz. 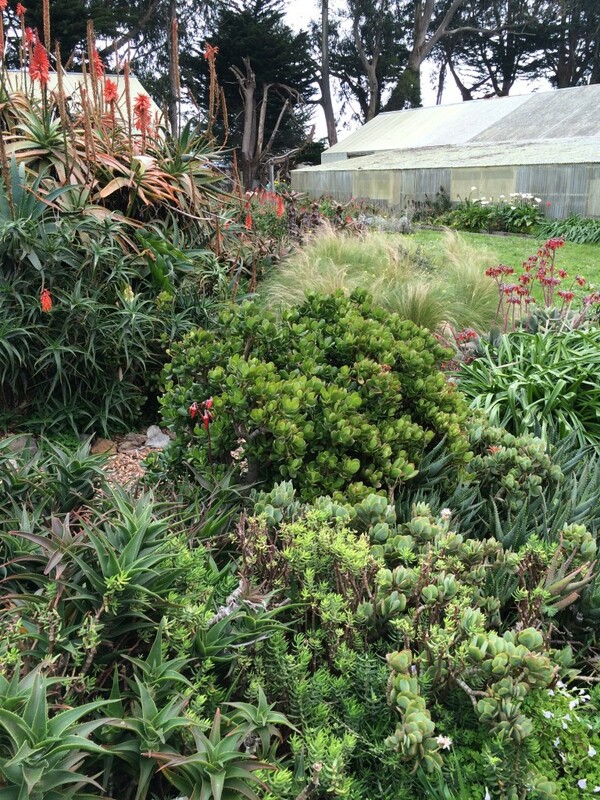 The Marin-Bolinas Botanical garden was started by Dr. Herman Schwartz and contains over 2000 species. A YouTube video of an interview captures him well as he sits in one of his greenhouse. An early interest in plants and animals started him on his lifelong passion for plants. Although Dr. Schwartz passed away in January 2008, his passion lives on. 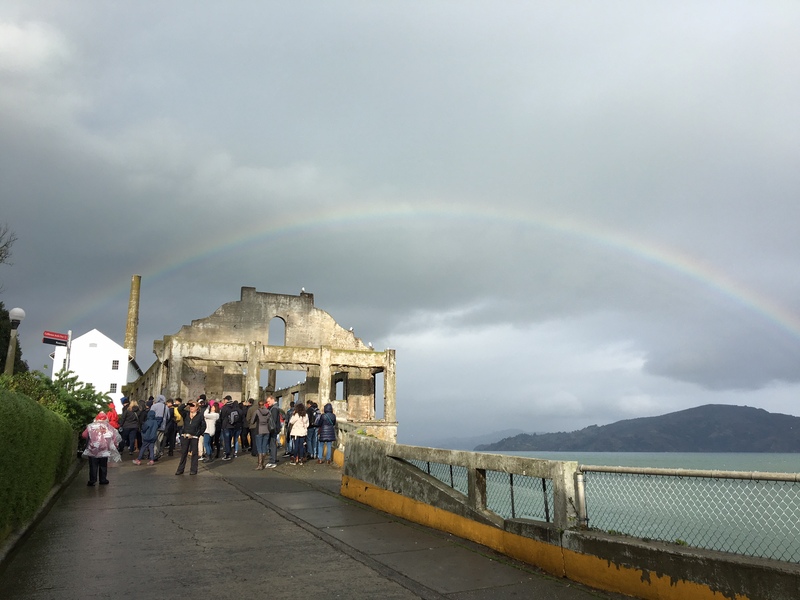 The trip was a privilege, arranged by a common friend of Dr. Schwartz’s son, David. I had only been once before in 2010 with Brian Kemble, curator for the gardens. Just like then, I was astounded by the rich variety of succulents and euphorbias. 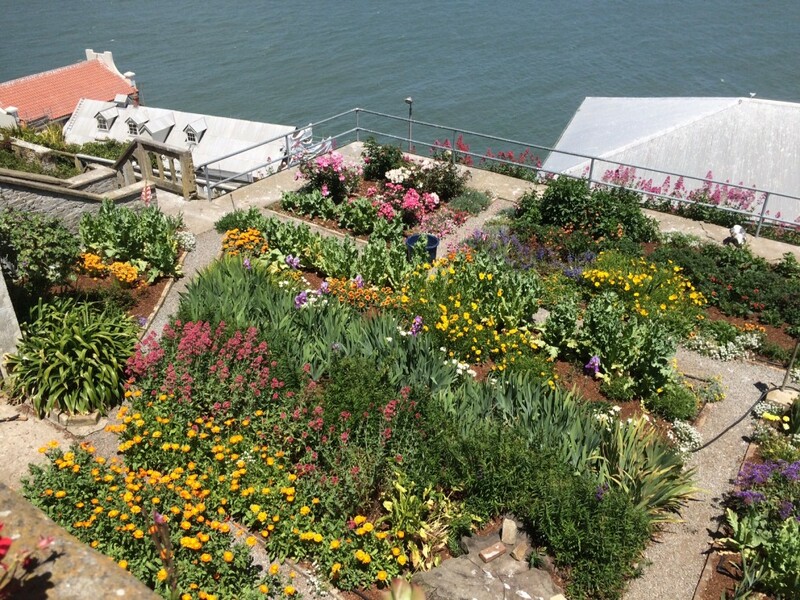 The garden is similar to Alcatraz’s gardens in a way – both are very unexpected in an unlikely place. Both have plants gathered from all over the world, in Dr. Schwartz’s interview, he says “I don’t have to travel anymore because I can transport myself to where I found them”. As we stepped from the car, many succulents were in full bloom, and the sheer size of the garden hit us. 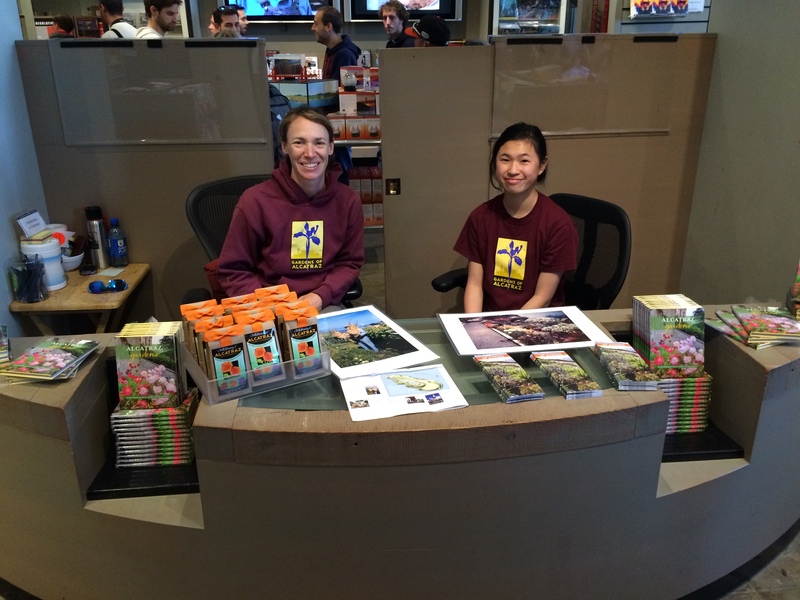 Like kids in a candy store, we almost didn’t know where to start first! We could barely walk 5 feet without stopping and spotting a new plant, we soon had our bag full and we realized we didn’t bring enough bags. Memories of trick or treating came back – a full bag and still more stops to go. Luckily the car was nearby. It was fun to point out the plants that I had collected back in 2010 to the staff gardener and intern. 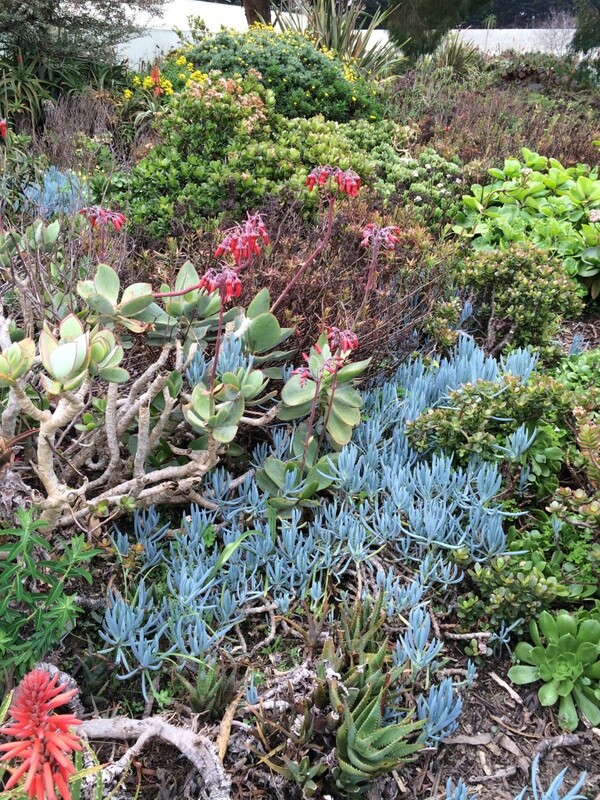 All of the plants are thriving on the island – Cotyledon orbiculata (gray and green forms), Echeveria pulvinata, and Aeonium cuneatum to name a few. We did find new Kalanchoe, a new red blooming Orbiculata, a blue Senecio, Dudleya, Agave victoria-reginae, of which there was only one so we did not select it but we will soon be sourcing it. Without Brian on this visit, I will soon be in touch with him for the correct names of the cuttings we took. 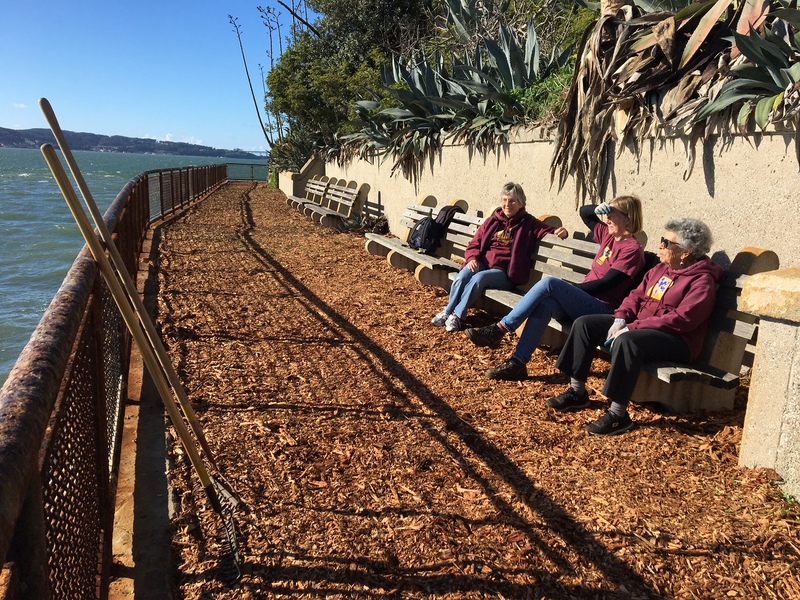 When these are added to the Alcatraz gardens, we will also update our plant collection database and will proudly note where the cuttings came from. 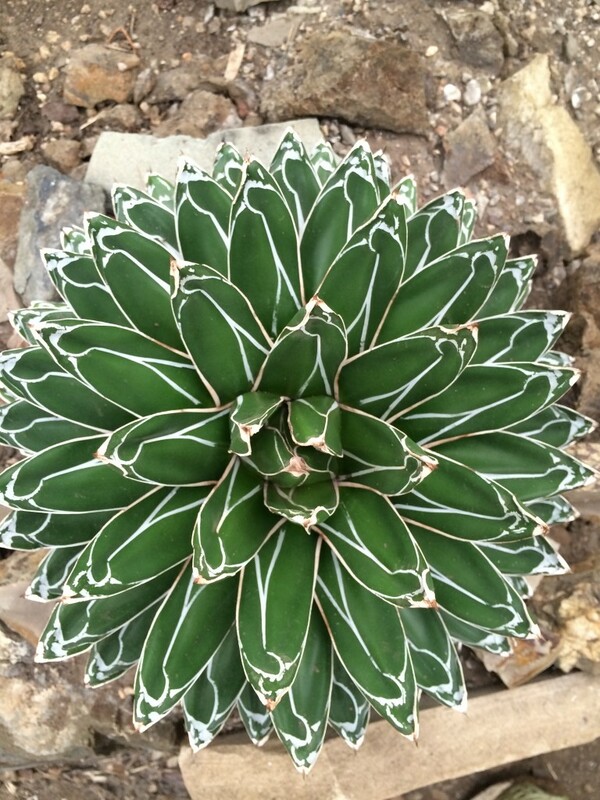 Agave victoria-reginae. Photo by Shelagh Fritz. Walking in this garden was an honour, and just like our own Alcatraz gardens, the presence of past gardeners was felt. 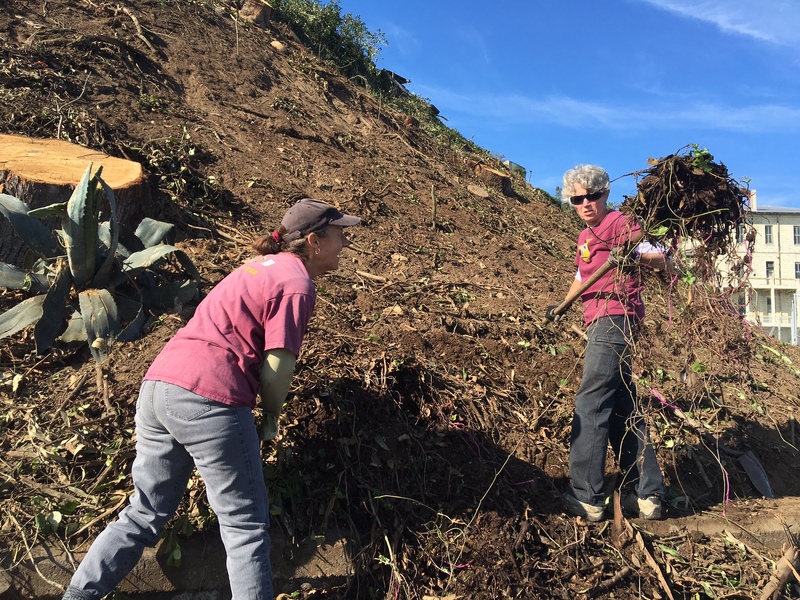 With respect, we took our cuttings, and I hope our joy of finding new treasures and our delight at spending time in this garden could be seen by Dr. Schwartz. I hate to complain about our winter temperatures while other parts of the United States hunker inside from cold weather warnings BUT, it was rather chilly for our succulents and tender plants on the island last week. Seldom do we receive a frost in San Francisco, let alone on Alcatraz, but the low temperatures and wind did cause minor damage to our Aeonium arboreum, Zantedeshia aethiopica (calla lily), and Tropaeolum (nasturtium). 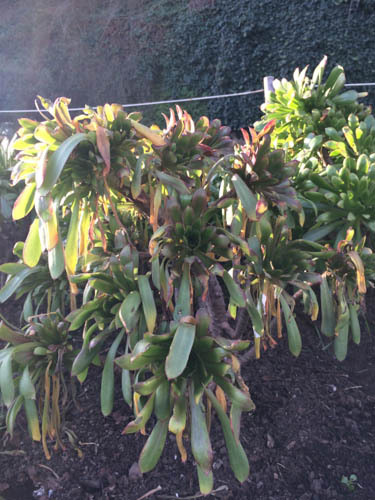 It is difficult to have an exact temperature that the damage occurred on these plants, but Aeonium can tolerate freezing for a half a day to a day before the plant would actually die. Our plants look like they are all nodding their heads and will make a strong recovery. 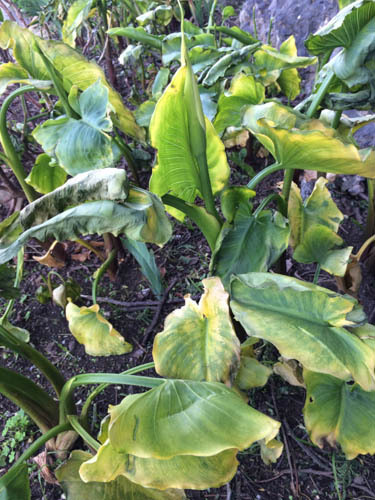 As for the calla lilies, the leaves are mottled green and are turning mushy, resembling spinach that has been frozen in the back drawer of a refrigerator. The tough rhizomes will send up new leaves, and might just have a later bloom than normal. 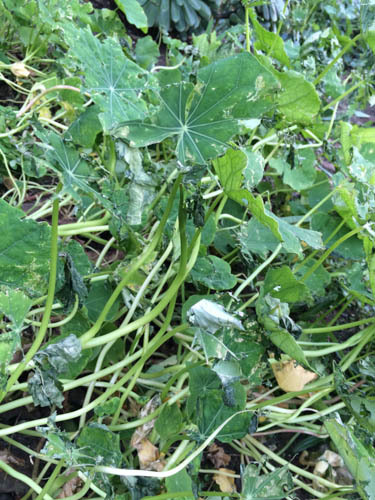 The nasturtiums we ended up removing as the leaves looked very tattered and were turning yellow. There are enough seeds dormant in the soil from years of these annuals setting seed, so they will replace themselves soon enough. 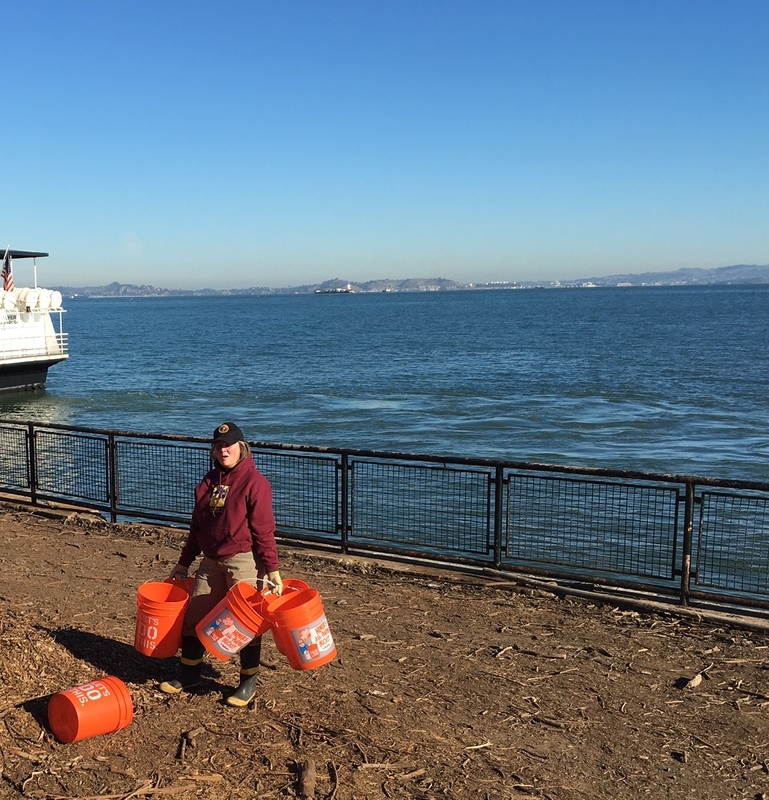 An interesting fact about cold winter temperatures is that in 1933, the California Horticulture Society began because of an “in the winter of 1933 an unusually frigid air mass withered gardens in the greater San Francisco Bay Area. 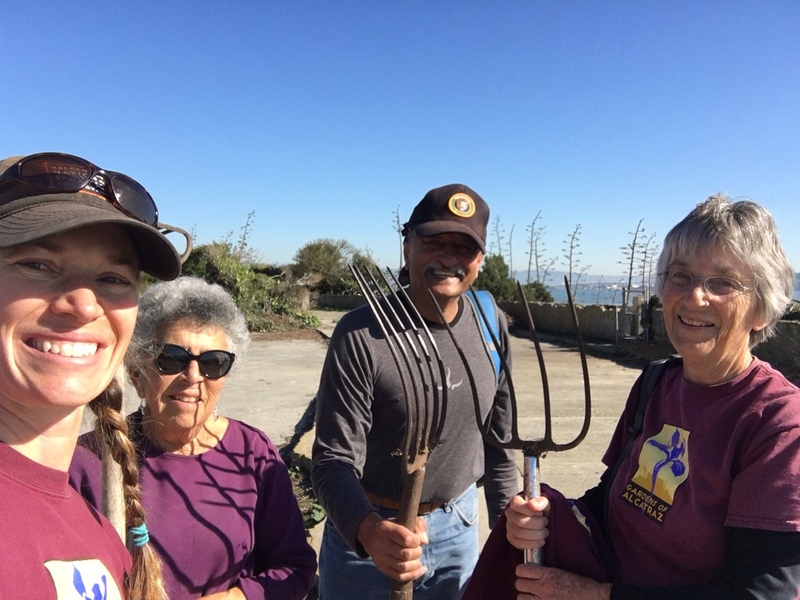 A small group of concerned gardeners met to compare plant survival information, and they became the nucleus of the present Society.” – Which also happens to be the oldest plant association in California! It’s always interesting to compare notes with other neighbour gardeners to see how their garden fared a cold snap – you may even pick up a few new hardy plants. 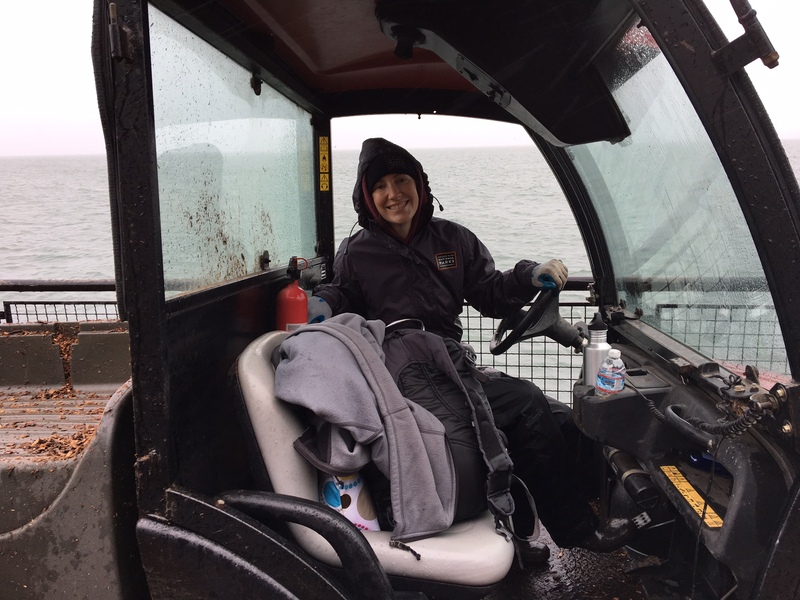 With Northern California experiencing the most rain we have had in 3 to 5 years (depending on who you ask), it seems a bit ironic that this post is about our new irrigation system that we installed this week. We are VERY happy for the rain, even if it meant the island was closed today. With three years of drought, the winter rains we had been receiving was never adequate to fully saturate the dry soil, and while water catchment would be filled, there was a deficit of moisture in the ground each year. All of the gardens are hand watered except for the pelargonium trough, the new lighthouse lawn and the toolshed terraces. 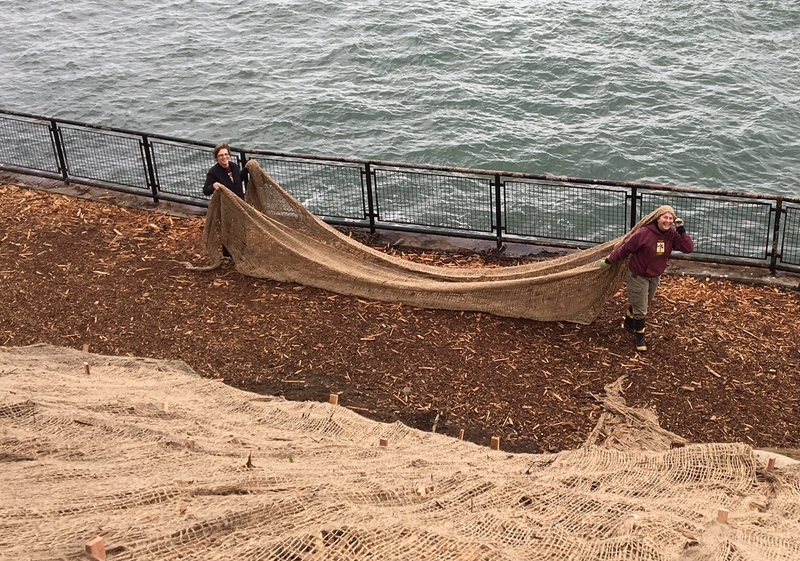 The trough line was installed when the pelargoniums were planted in 2005, and we recognized the need to water the dry toolshed terraces last winter to keep the plants healthy and thriving. This past summer, staff and volunteers spent the majority of working days hand watering the remaining gardens, and often, our efforts were still not quite enough. The plants got by on rationing our supply and when our tanks went dry we were lucky enough to still have access to the barged in fresh water. 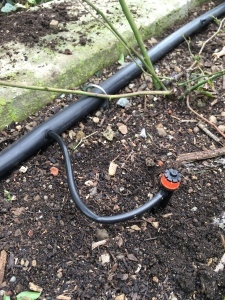 We wanted to be proactive this year, and not only save ourselves time watering but use the water more efficiently by installing water emitters directly to the plants. 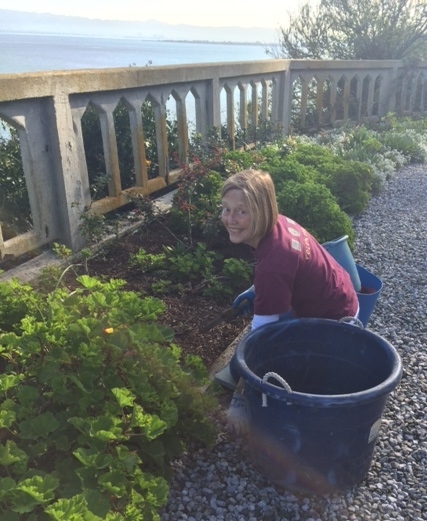 The rose terrace is supplied by one tap that is gravity fed from the holding tank at the summit of the island. The rose terrace itself is flat but there is enough pressure to meet our needs. 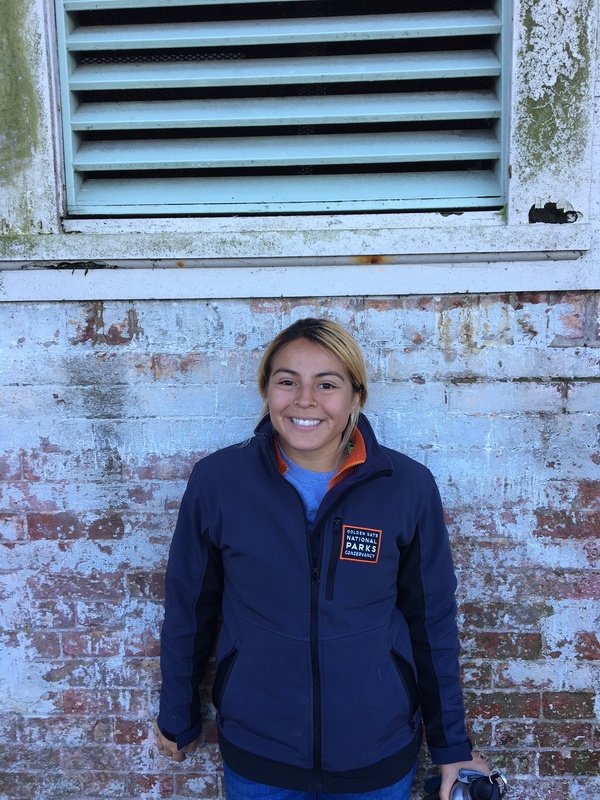 Staff member, Karolina, designed the rose terrace to have 4 irrigation zones. Each zone, running by its self has enough water pressure to fully cover all of the plants in each zone. 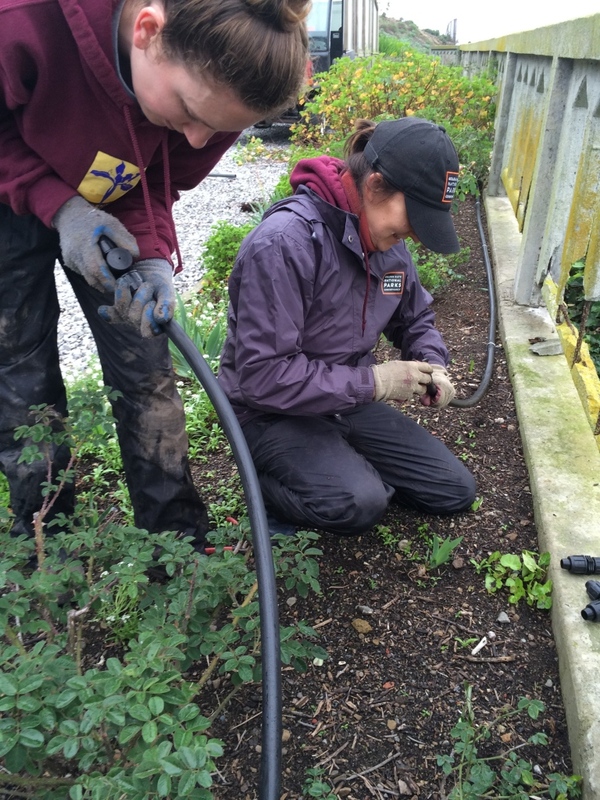 For each zone, we have a 1” pipe that will connect to our garden hose. Using shut off valves, we can select which zone we will water. Connected to the large pipe are the ¼” spaghetti tubing connecting a bubble emitter at the base of each plant. 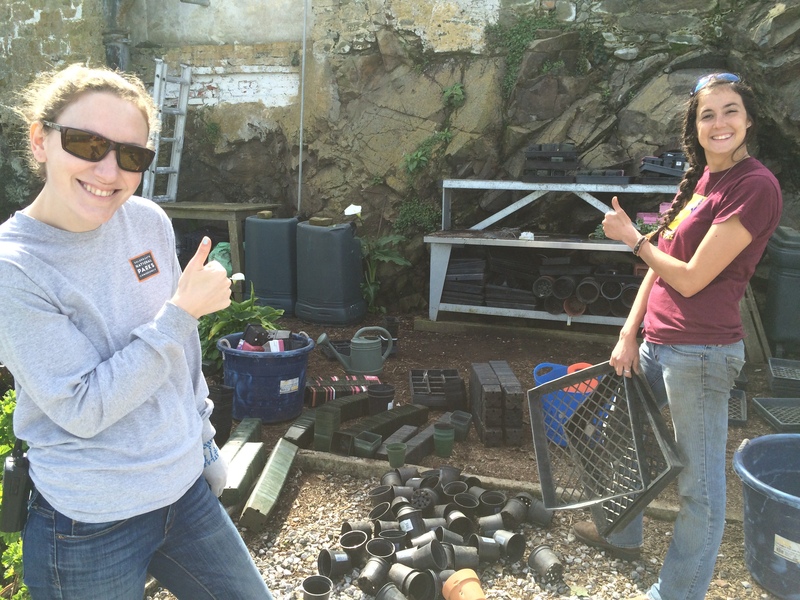 We can even adjust for future plantings by adding a spaghetti tube or by plugging a hole and removing the tube. A pretty simple system for the do it yourself home gardener that will undoubtedly save time. 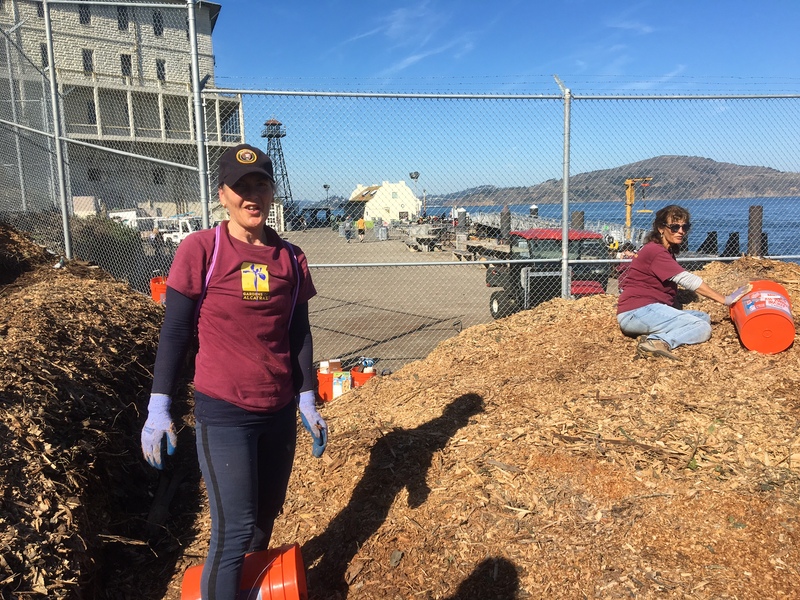 Posted in Gardens of Alcatraz, Sustainability	| Comments Off on Yay for Rain! 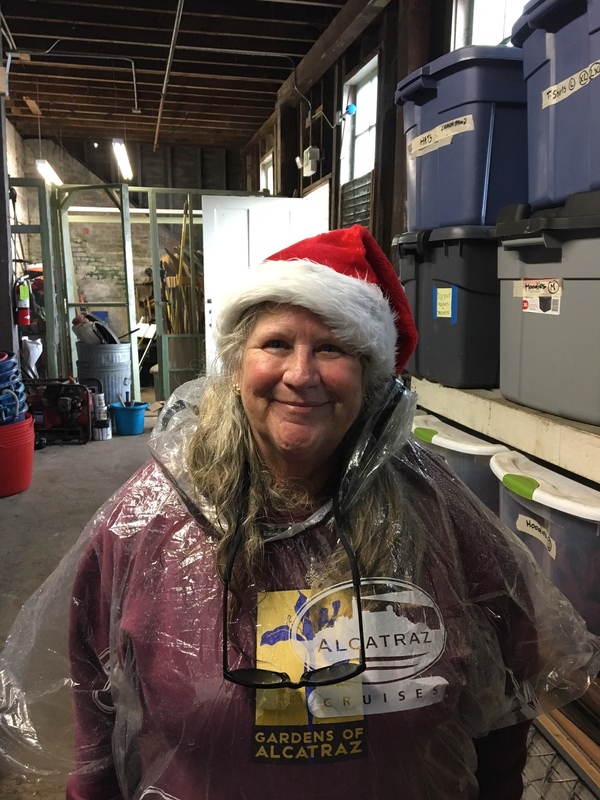 Santa will not likely be coming to Alcatraz any time soon, but we made a wish list of new plants anyway. 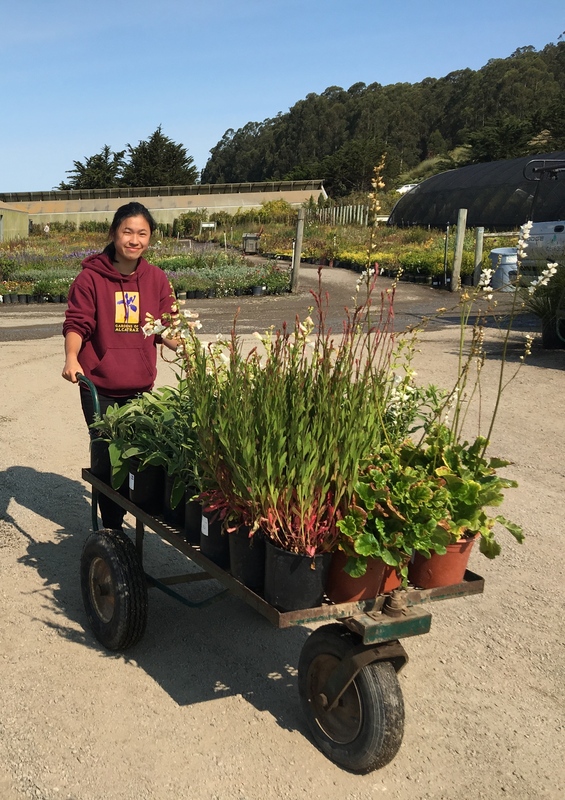 With the winter rains, comes planting season; and it is our best opportunity to take a close look at the gardens and order new plants. 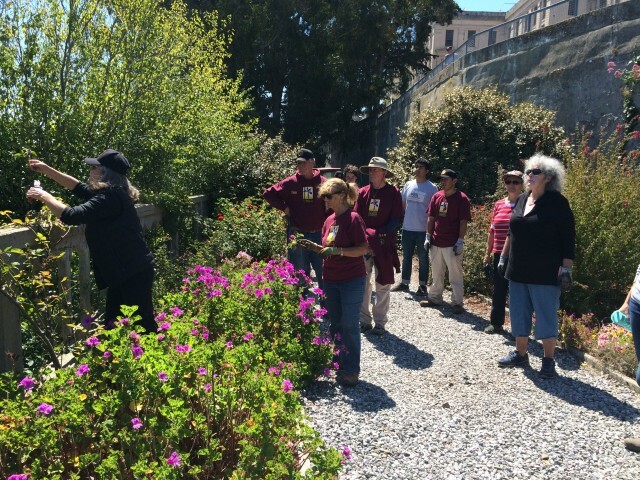 Last week, garden staff walked through all of the gardens, scrutinizing each flowerbed. With 5000 visitors each day to looking at the gardens, we are fairly critical of the plantings, as we want the visitors to see the gardens at their best all through the year. 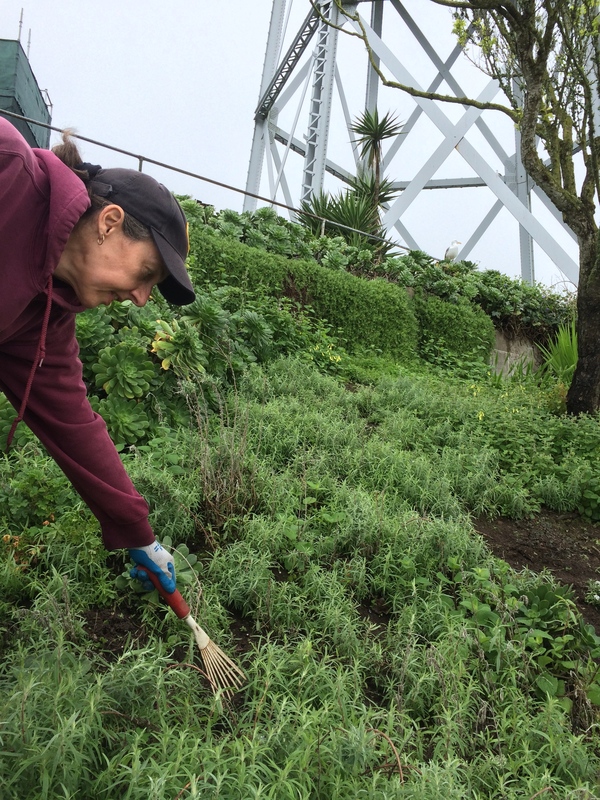 There are a number of reasons why we change plants – the plant was too high, didn’t bloom, was a target for the seagulls, or it simply didn’t do well enough or the plant did really well and we would like more (yay!). And of course, there is the ‘cause of death unknown’ reason (which even happens to people with green thumbs). Two plants on the wish list that did really well and we would like more of are Penstemon heterophyllus ‘Blue Springs’. This pretty blue native with a pink tinge looks amazing with yellow Coreopsis and red Gaillardia. Another new favorite is Echium gentianoides ‘Tajinaste’. This is a blue flowered Echium that we planted on the Toolshed Terraces last year. The low height gave a great display behind white roses and did not grow too high to block the terraces behind it. This Echium also blooms the first year it is planted. 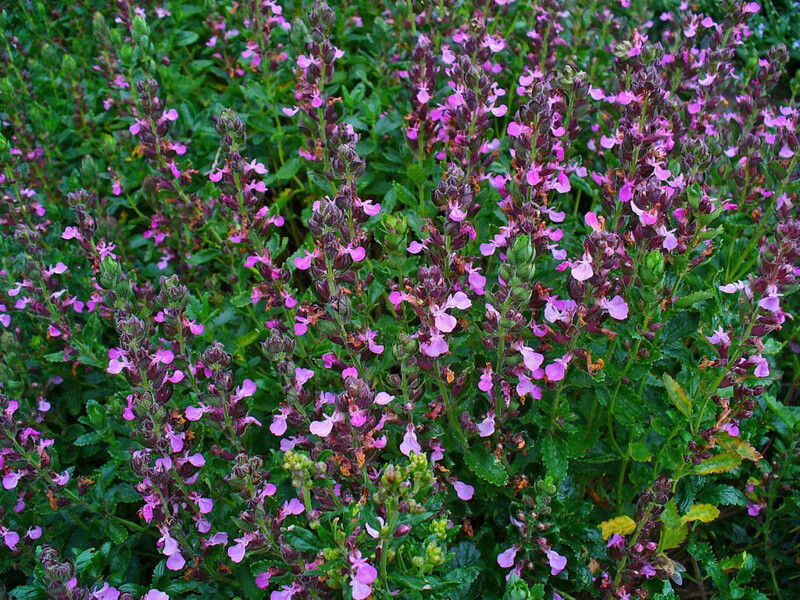 A new plant that we are going to try this year is Teucrium chamaedrys, a germander. We have a tough garden spot along a walkway that has two very narrow beds that are shallow. Spring bulbs do well in these beds, but for the summer, it is difficult to start any annuals as the gulls take their toll on the new plantings. Establishing 4” pots of this germander during the gull’s absence may be the trick. The spring bulbs will still come up through this perennial. A new plant that we will try this year – Teucrium chamaedrys. I highly recommend a garden walkthrough with critical eyes at the end of every season. Quite often, when you are working in the garden and you notice that you wish to make changes of particular plants, you get distracted and forget about your brilliant idea. 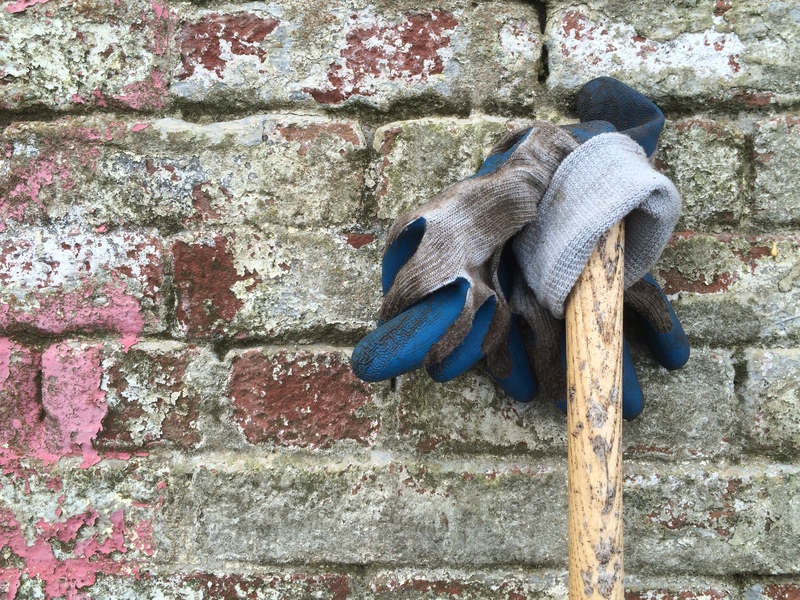 Having your garden task being solely to examine your garden should be a part of your season’s end cleanup. Be sure to take your smart phone to take photos and a note pad. California is entering what is typically a dry time of year, and with the severe drought, this year is especially tough. 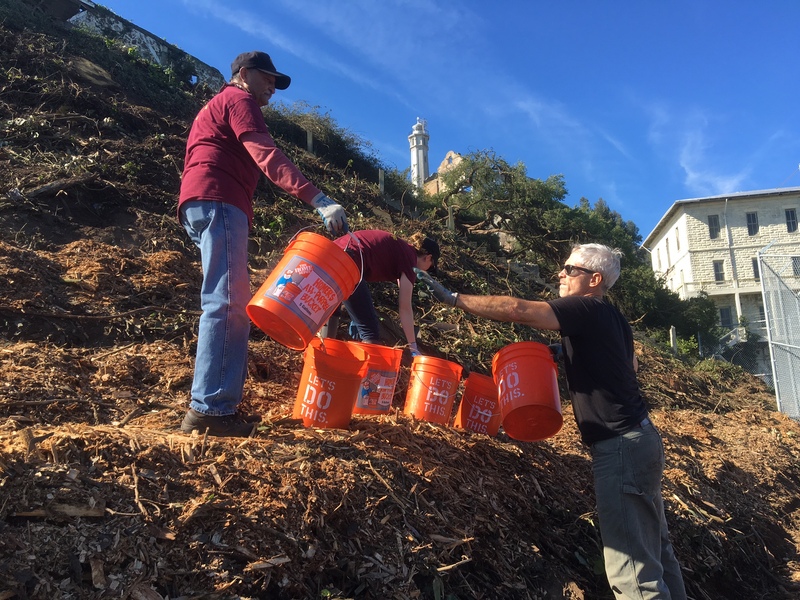 On Alcatraz, we have cut back on watering in the gardens and have altered our watering schedule to water less frequently but longer so the water can soak deeper into the soil. The plants are coping with reduced water and it is interesting to see how different plants are responding. The survivor plants – the plants that were able to cling to life after the Federal prison shut down in 1963 – are demonstrating their true strength. For example, the plantings of Pelargonium on the Rose Terrace are all heirloom cultivars but are either survivor plants from the island or are ones that we purchased and introduced. 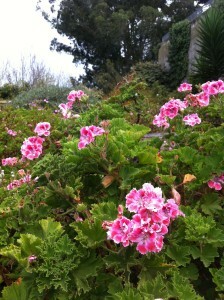 We even have three Pelargonium that were propagated from the Presidio pet cemetery where they receive no water or care. The island survivors are coping well and are blooming away after a short dormant period. They include plants with the names of ‘Prince Bismarck’, ‘Mrs. Langtry’, ‘Brilliant’, ‘San Antonio’, Pelargonium quercifolium, and ‘Alphonse Ricard’. In our gardens, some of these slow down with the blooming in July and do have rust spots on the leaves and tend to drop the lower leaves but by the end of August, they are rebounding and are back in full bloom. the Pet Cemetery. I’ve only been able to positively identify one with a name as being Pelargonium ‘Apricot’. 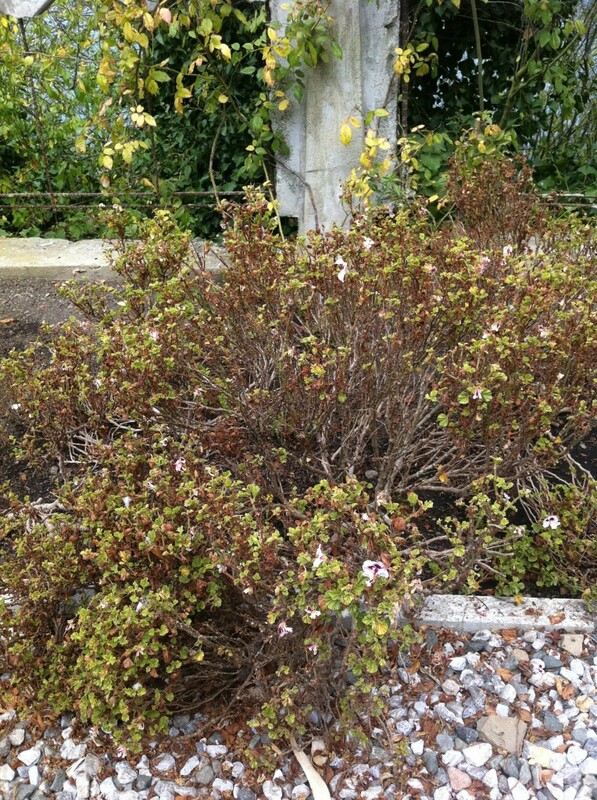 This one has scented leaves that are very lobed and crinkly with rose/pink flowers with a white center. This is a non-stop bloomer from spring through to the beginning of winter for us. We have another two that are Martha Washington varieties in two different shades of pink. Contrasted to our survivors, the purchased pelargonium have really slowed down with blooming and with overall growth. For most of them, they have finer leaves and are more delicate. We do give them more water than the survivors, but without the extra love, I’m sure they would not make it. Even though they may not be much to look at right now, they are still impressive for their ability to cope through the summer and once spring arrives they will be blooming fearlessly. I confess, I’m always on the lookout for plants growing in the toughest and unlikely places. Just last night, while attending a Park Academy class at the Fort Scott Community Garden in the Presidio, I noticed some pelargonium with wooden stems spilling out of wine barrels. I caught site of another fuzzy leaved one growing alongside a potting shed. Another scented leaved one was spotted growing in the herb garden! Very exciting to find these tough guys that were obviously heirlooms. With permission, I took cuttings of each and hope to find names for them and see how they do with our Alcatraz collection.